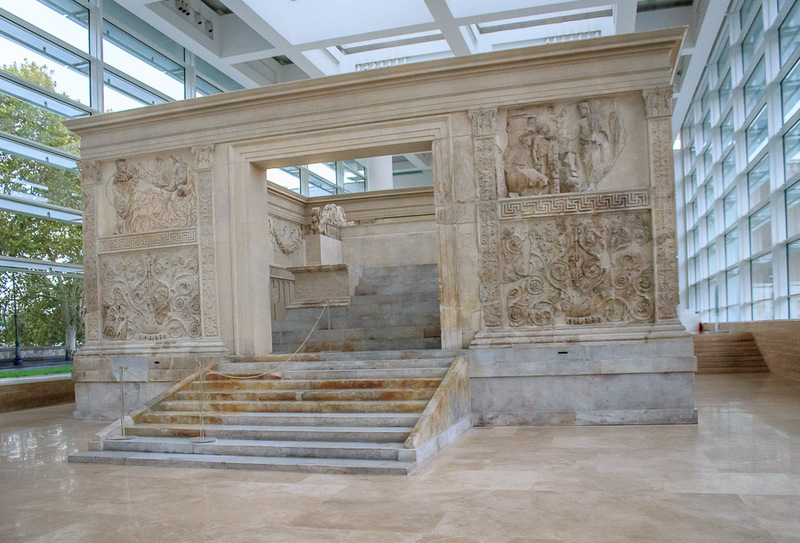 The Ara Pacis Augustae (Altar of Augustan Peace) is a sacrificial altar commissioned by the Roman Senate on July 4, 13 BC to honor the triumphal return of emperor Augustus from his campaigns in Hispania (Spain) and Gaul (France). 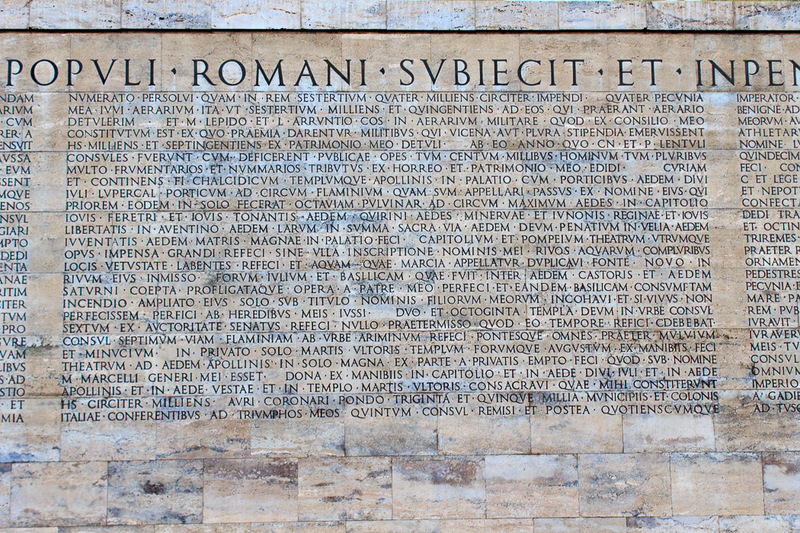 It was consecrated after 4 years of construction on January 30, 9 BC to celebrate the peace and prosperity in the Roman Empire after Augustus' victories, and to act as a visual reminder of the Julio-Claudian dynasty that brought it about. 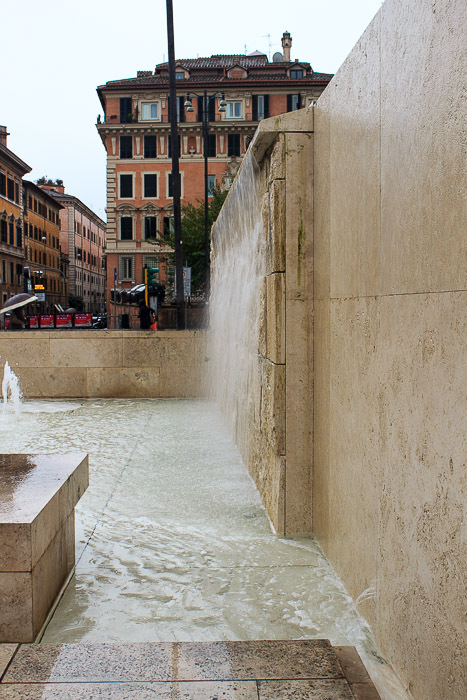 It was originally located on the west side of Via del Corso, at the spot along the eastern side of today's San Lorenzo in Lucina, about five blocks southeast of its current location, or six blocks southwest of the Spanish Steps. The sacrificial altar, made of white marble (1st photo below), is enclosed within a rectangular marble building called the precinct (2nd photo below), about 35 feet by 20 feet, with sculpted friezes inside and out. 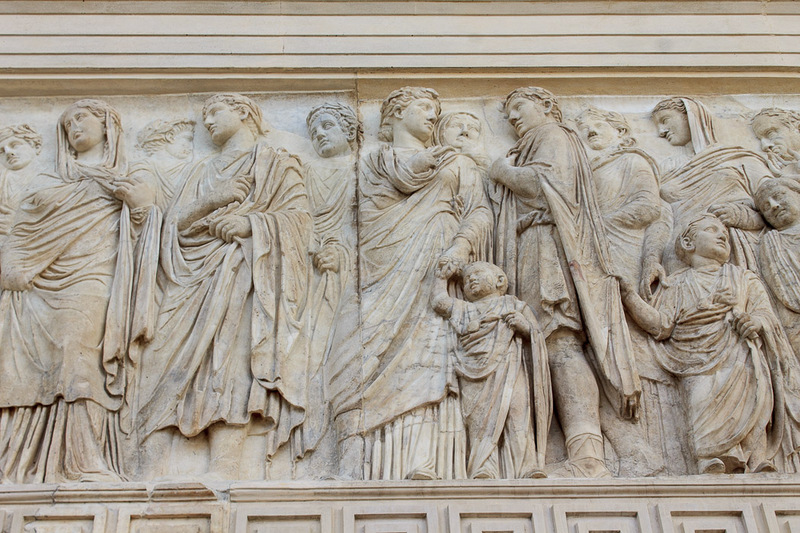 In ancient times the friezes would have been painted, just as many statues were painted in ancient times. 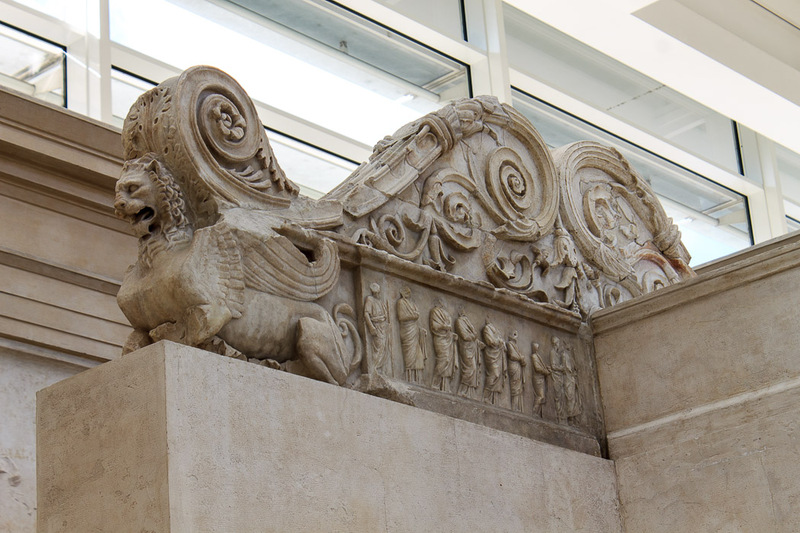 Today they're plain white (as are most of the statues), but the Museum of Ara Pacis occasionally holds a special event during the evening in which the theorized original colors are projected onto the Ara Pacis. 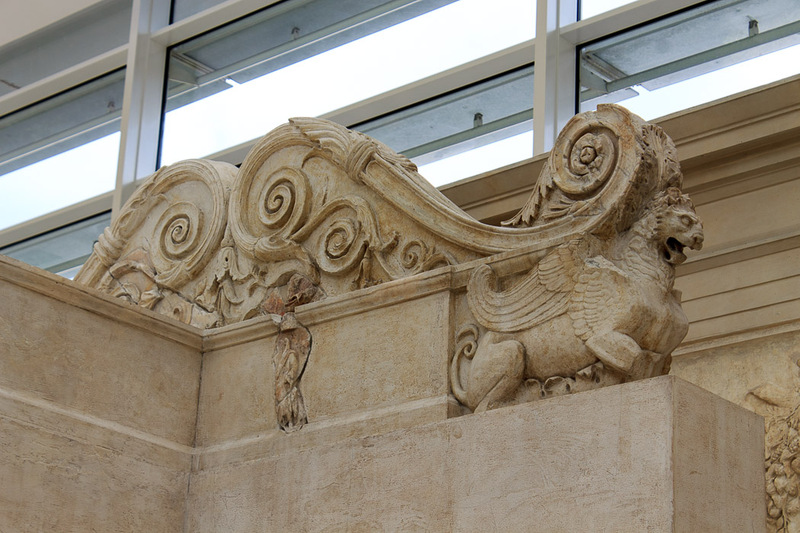 See all Ara Pacis photos. 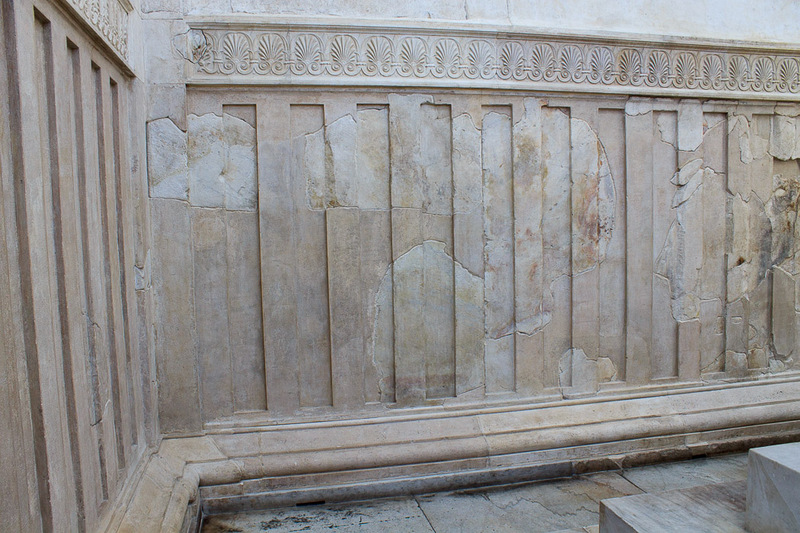 Both the inner and outer friezes on the precinct (the marble building) are divided into an upper register and a lower register by a border. On the outside of the building the lower register is a floral pattern which goes all the way around the building. The upper register contains the more interesting historical scenes involving characters (1st photo below). The long sides of the precinct are both considered to be fronts, one front for the public, one for the clergy, with both containing entrances into the interior where the sacrificial altar is found. 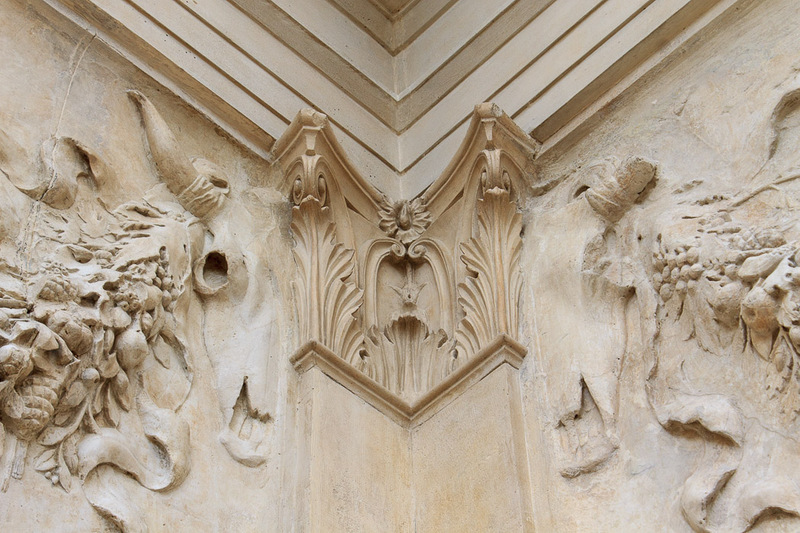 The characters on the upper register friezes of the two fronts are mythological. 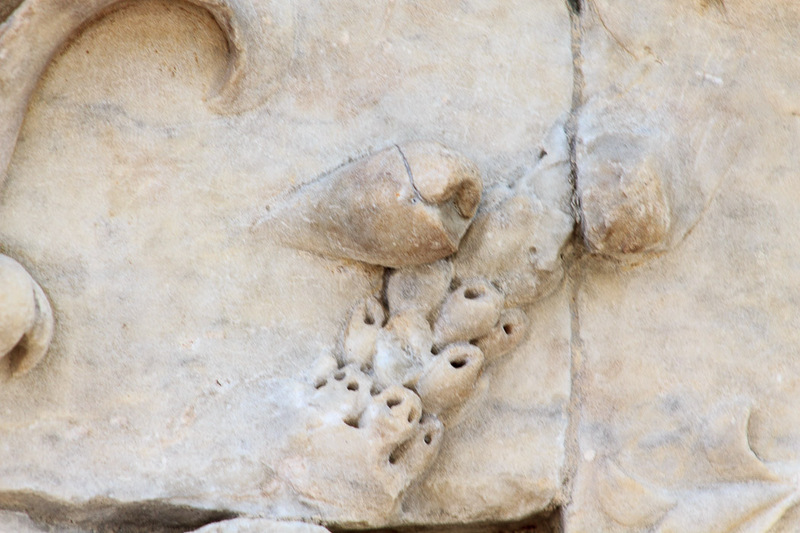 The upper register on the two short sides of the precinct show processions of real people associated with Augustus. 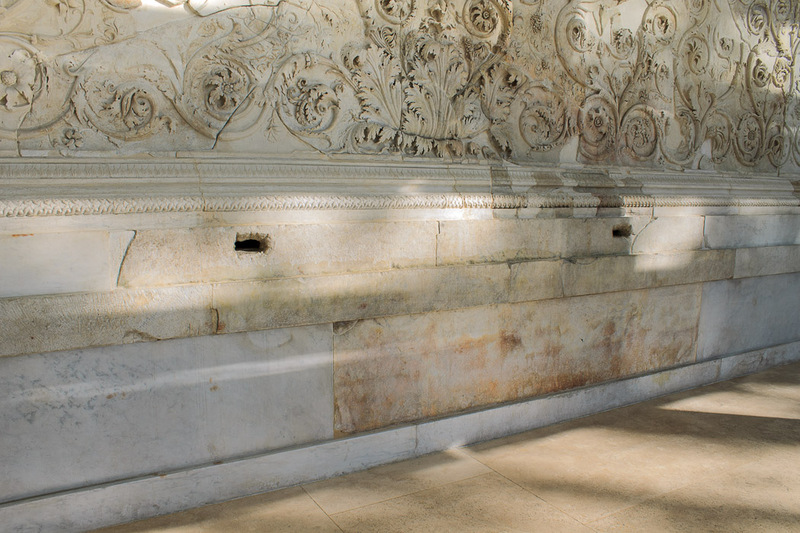 The inside walls of the precinct are also divided into two registers (2nd photo below), with the lower register resembling wood panelling, and the upper register holding decorative festoons, ox skulls and religious instruments. 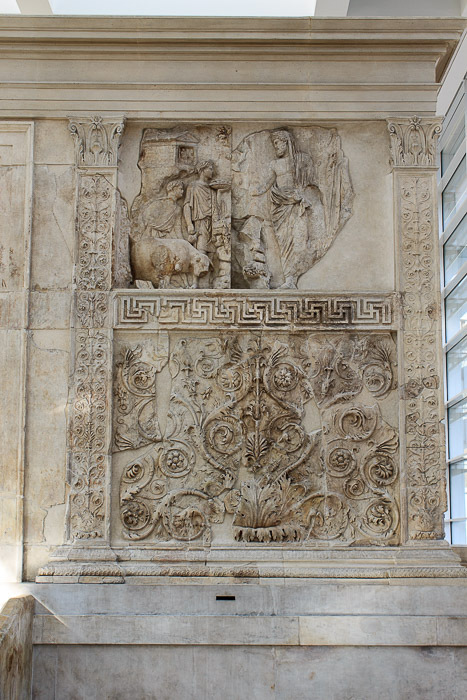 Fragments of the Ara Pacis were first discovered in 1568 beneath San Lorenzo in Lucina, and found their way to museums and villas such as the Louvre, the Uffizi Gallery, the Vatican Museum, and Villa Medici. They were identified in the 19th century as belonging to the same monument. 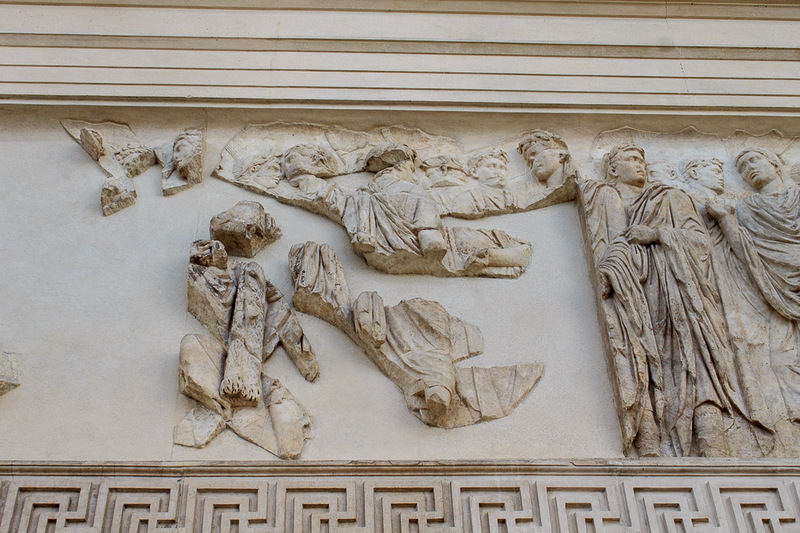 In 1903 the excavations were continued when the reliefs were identified as part of the Ara Pacis mentioned in Augustus' memoirs. Excavation under San Lorenzo in Lucina and the nearby Teatro Olimpia continued, and led to the extraction of large surviving parts of the altar and a fair idea of the shape and dimensions, allowing reconstruction in 1938. Unfortunately, this reconstruction was rushed to completion by Mussolini, resulting in some errors. Much of the reconstruction of missing pieces was accomplished through comparison with similar scenes on other Roman objects. 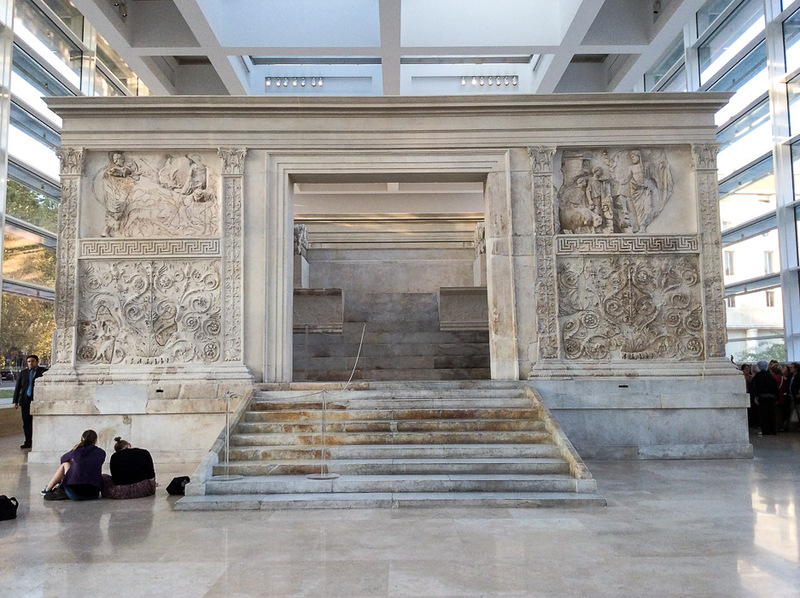 The reconstructed Ara Pacis that we can see today and which is shown in these photographs is actually mostly reconstruction, with the rather small number of available original parts. 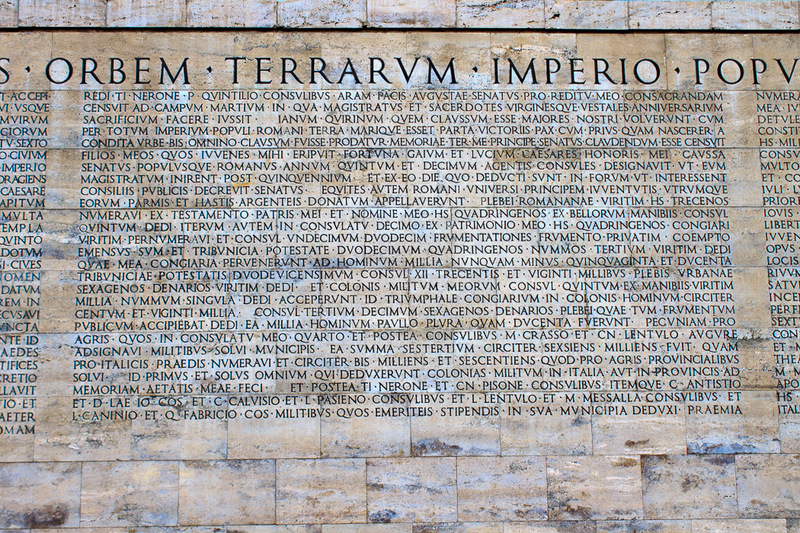 It now stands in a dedicated museum next to the Mausoleum of Augustus. 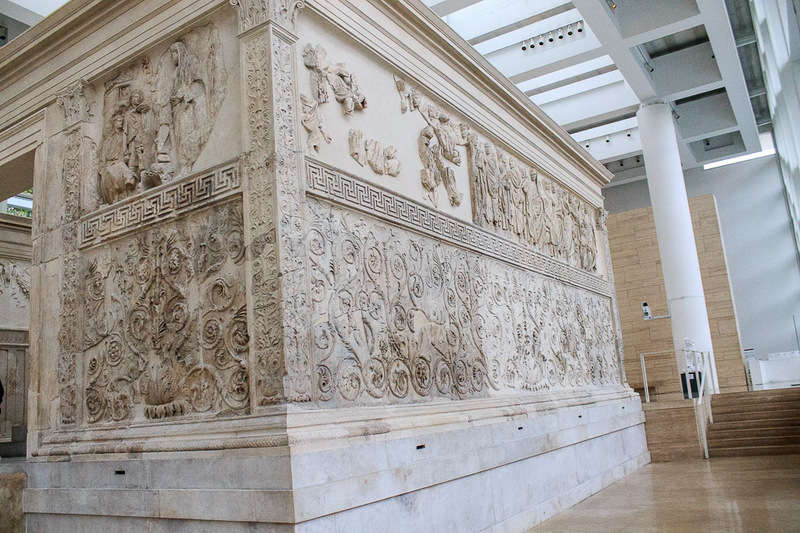 The museum is a modern glass and marble building, named the Museo dell'Ara Pacis (Museum of the Altar of Peace), opened in 2006 (1st photo below). 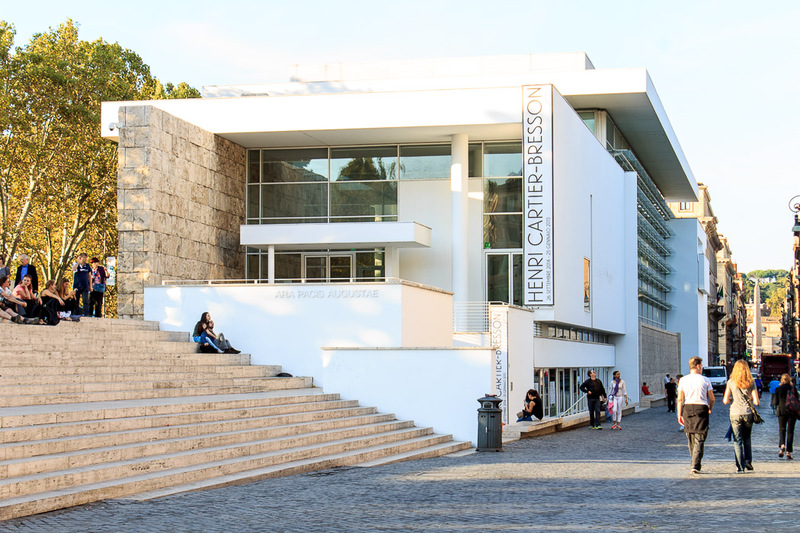 The large building dwarfs the Ara Pacis; the rest of the building is used for temporary and other exhibits, often not related to ancient Roman history. In the 1st photo below, the Tiber River is just beyond the trees at the left side of the photo, and the Flaminian Obelisk in Piazza del Popolo is visible at the right edge. 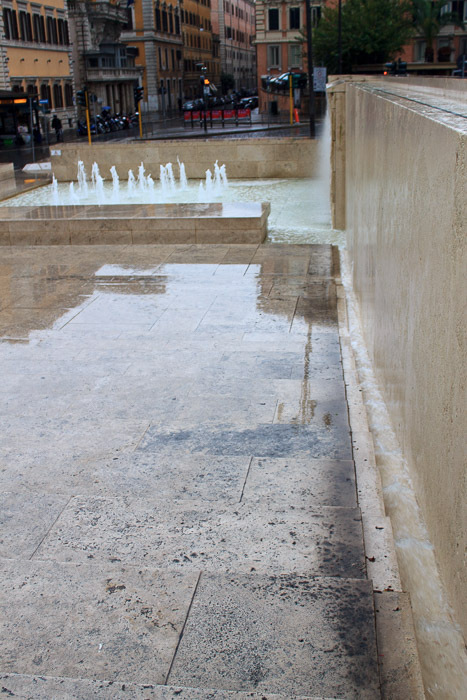 The 2nd and 3rd photos below show the Fountain in front of Ara Pacis, an interesting little fountain that runs down a wall, down a ramp beside the steps into the museum, and into a pool with water jets. 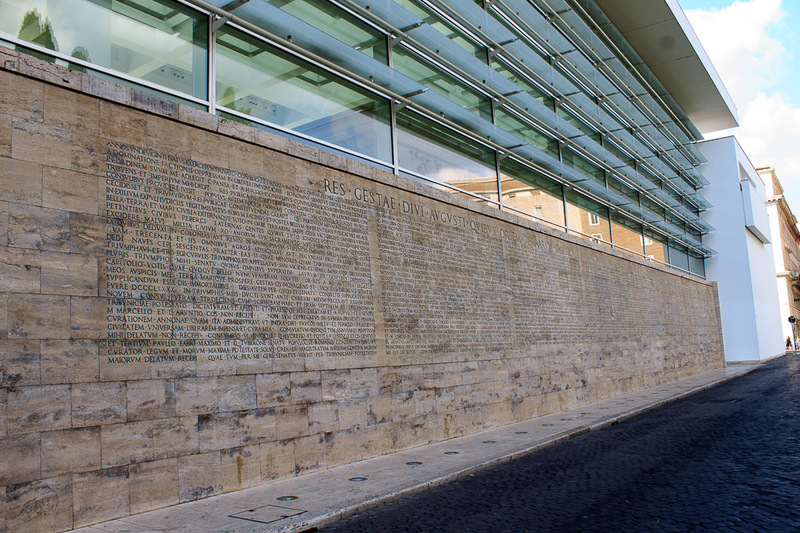 The 1st photo below shows the side of the museum building upon which is carved the Res Gastae Divi Augusti (The Deeds of the Divine Augustus), a personal account of his life and his accomplishments, written by (the humble) Augustus himself. 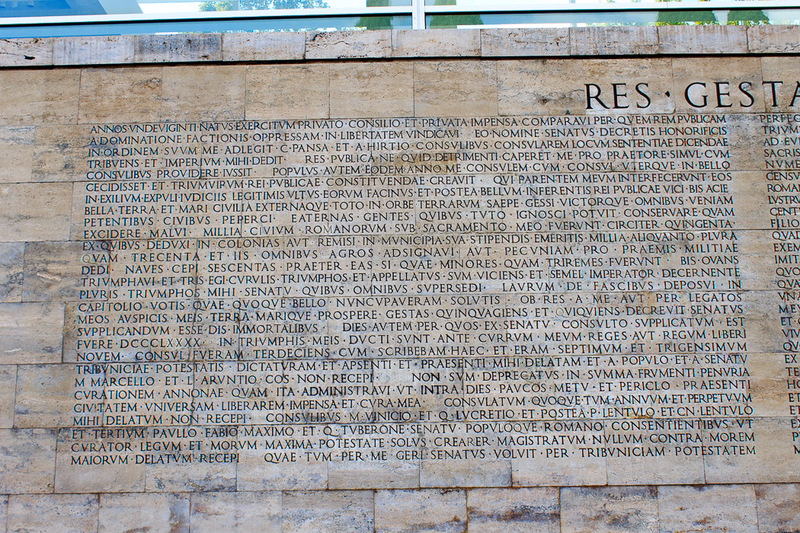 The full text of the Res Gastae Divi Augusti is shown in the 7 remaining photos below, and a translation which is fascinating and quick to read can be found here. 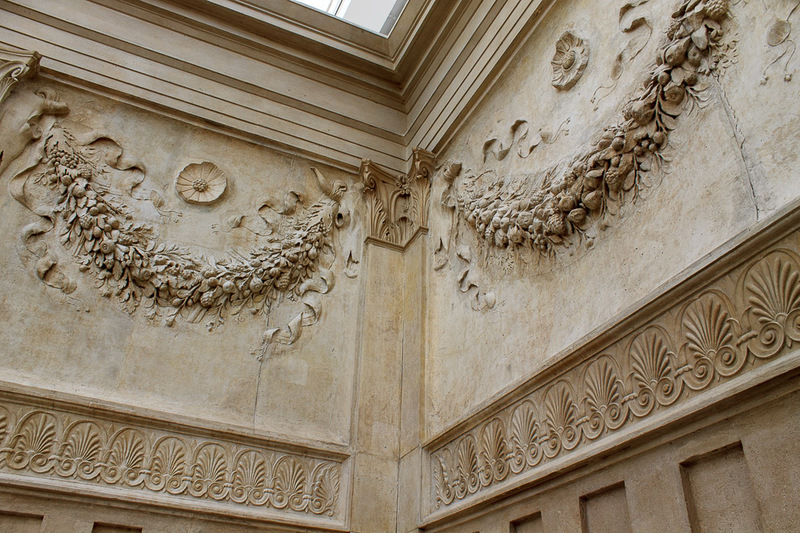 The enclosing marble room, called the precinct, rests on a marble base which is almost entirely a restoration. 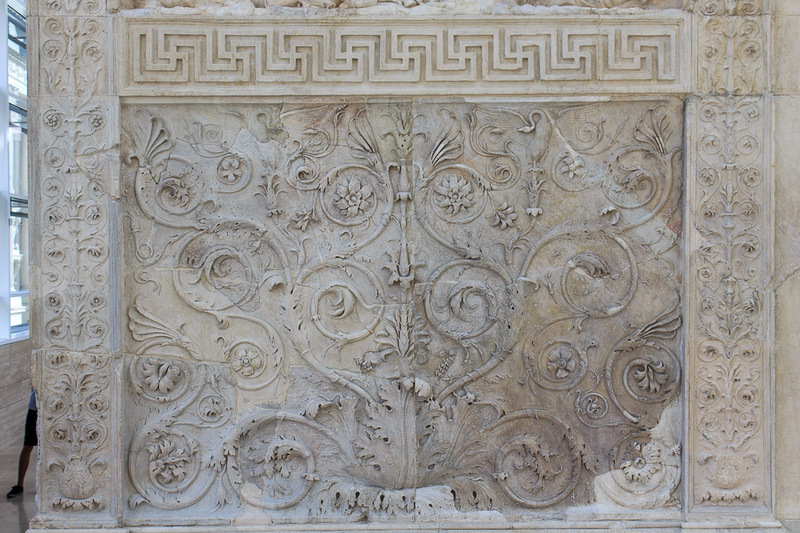 The exterior decorations on the enclosure are divided into two registers: the lower register consists of floral motifs, and the upper register consists of figures (see photo below). 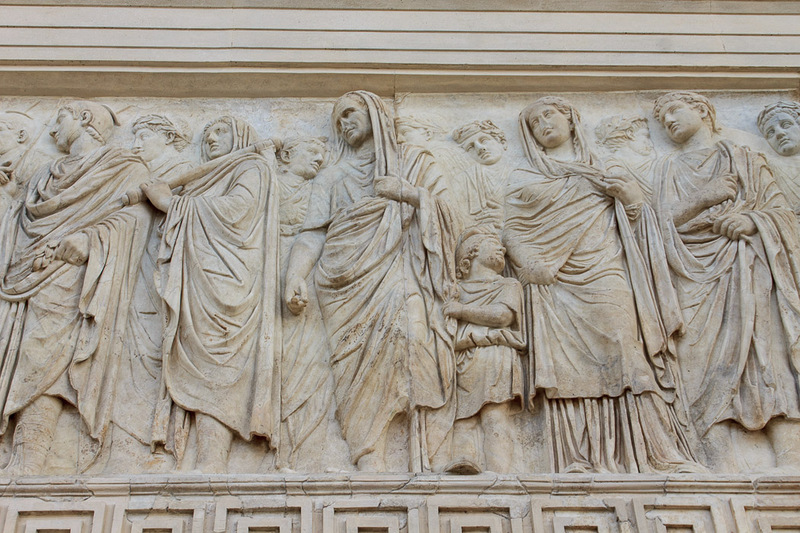 The figures around the two entrances are from mythological scenes, and those on the two sides are processions of recognizable individuals from the time of Augustus. 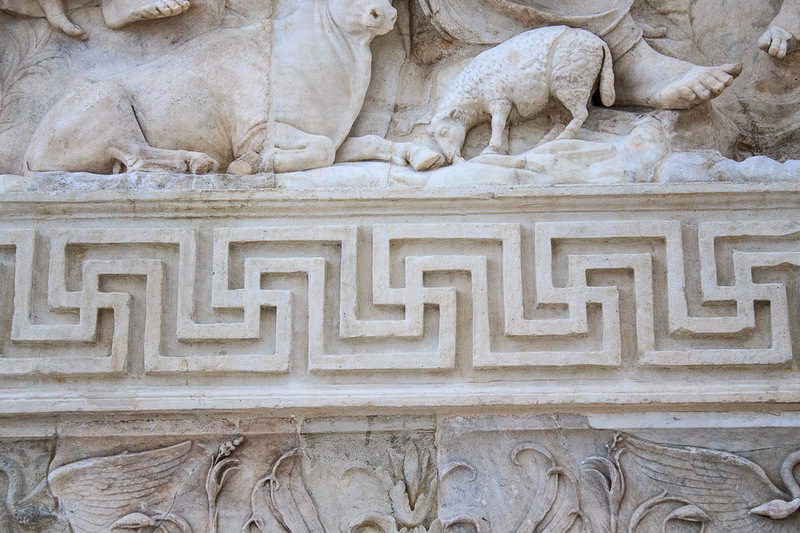 The two registers are separated by a band with a horizontal Greek meandering pattern, something like a row of connected swastikas, which is mostly reconstruction. 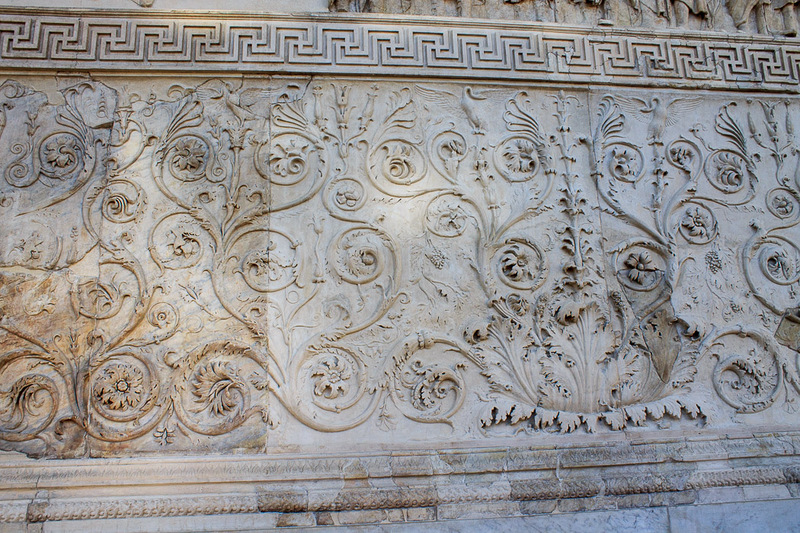 The floral frieze of the lower register is composed of spirals which start from a burst of acanthus foliage at the bottom. 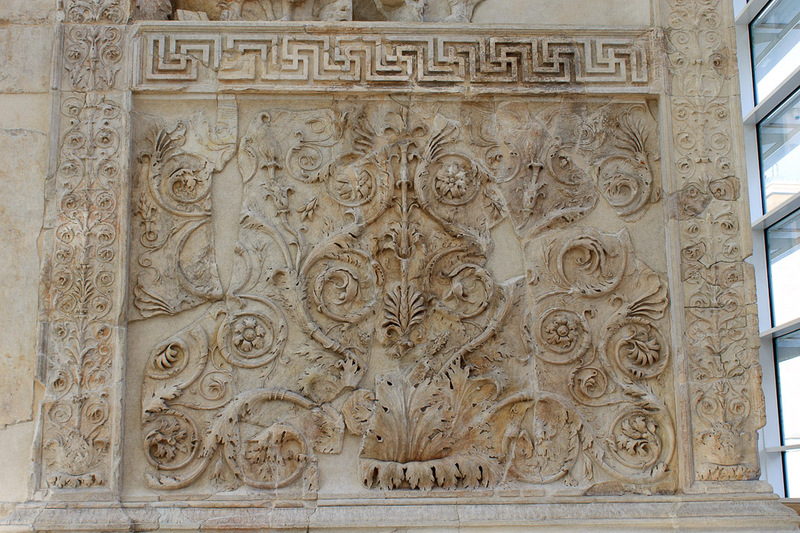 From the centre of the acanthus a floral pattern rises vertically. 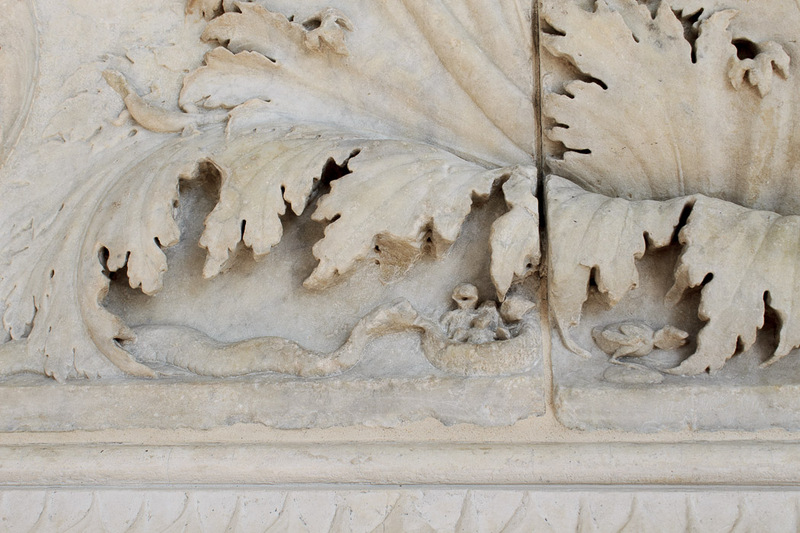 From the acanthus' spirals ivy leaves grow, as well as laurel and vines, tendrils and palmettes branch off, and flowers blossom as the stalks taper away, curling into spirals. Swans with outstretched wings live at the top. Small animals find a home in the depths of the vegetation on several panels. 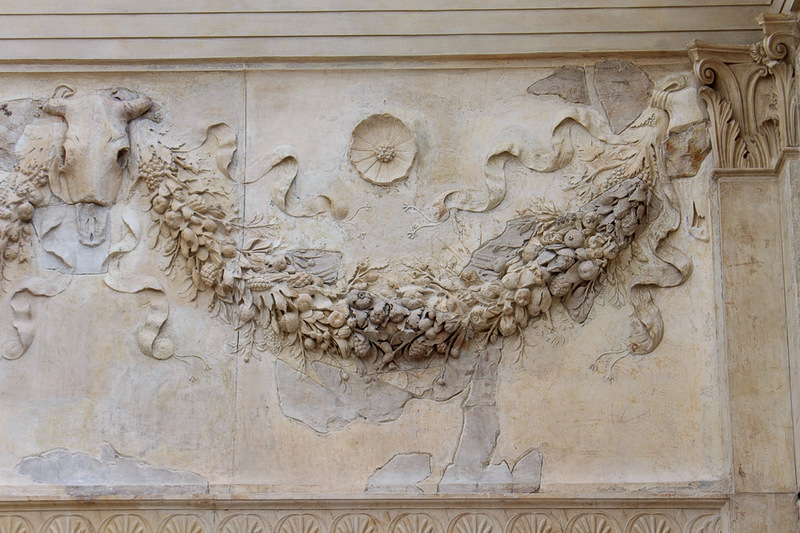 This floral relief is often related to Virgil's fourth Eclogue, in which the Golden Age, the return of peaceful, happy times is announced by the spontaneous production of bountiful fruit and harvests. 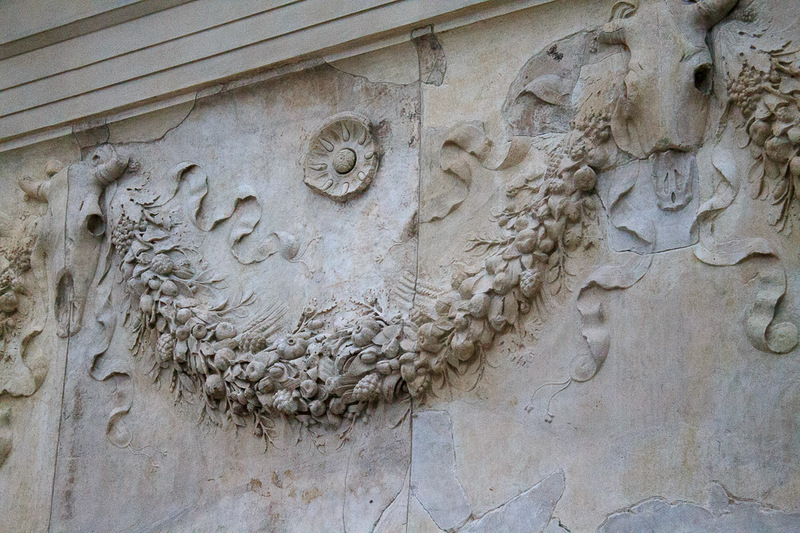 As well as a generic reference to fertility and abundance, consequent on a return to the Golden Age, the frieze can also be read as an image of the peace of the gods, of the reconciliation of the divine forces which reign over the entire universe, made possible by the coming of Augustus. 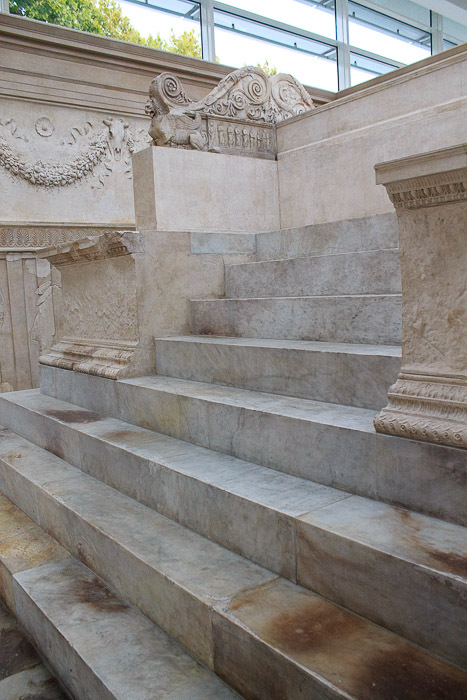 The Ceremonial Front is the side of the Ara Pacis with an entrance which has steps (see photo below). 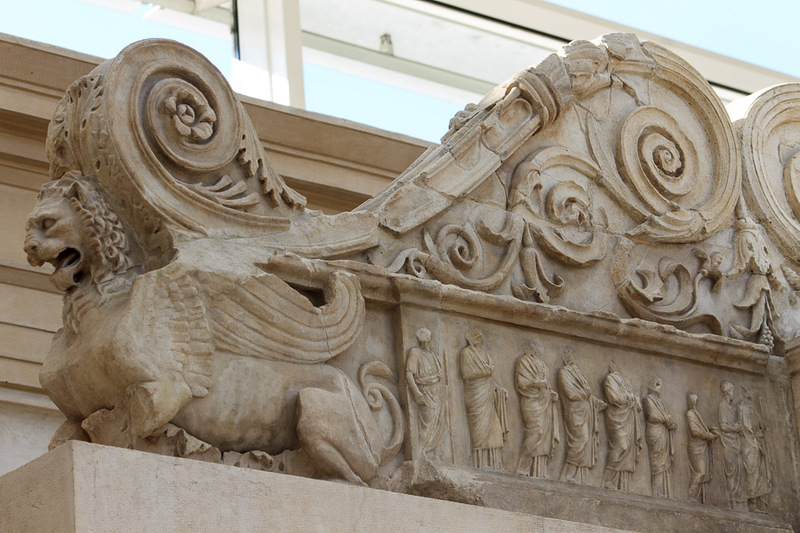 It's the side that faces the entrance to the museum, so is the first side of the Ara Pacis you'll see when you visit. This entrance was only used by priests, never by the public. It faced away from the Via Flaminia, toward the Campus Martius. 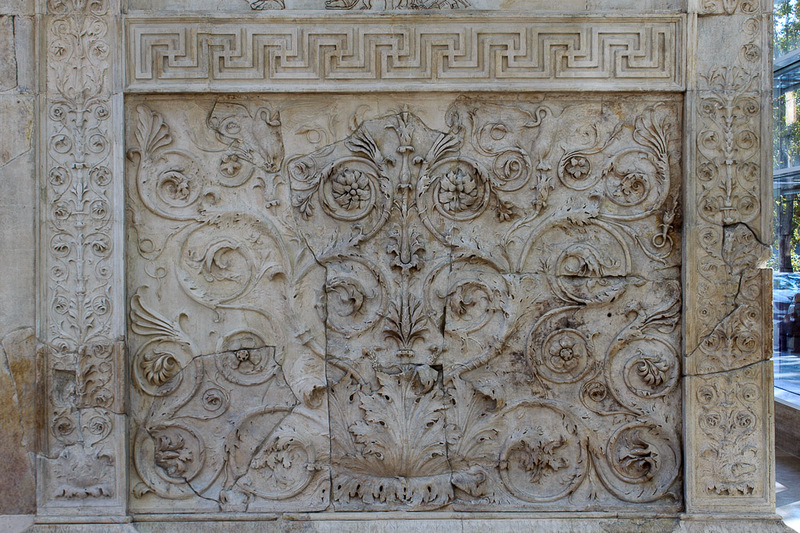 The upper and lower relief panels on the left side of the Ceremonial Entrance are mainly reconstructions since only small fragments survived. 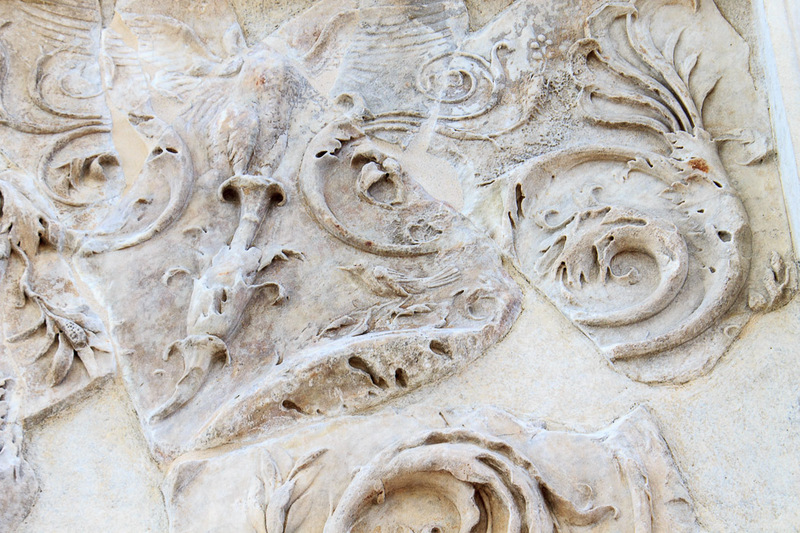 The reliefs on the right side of the Ceremonial Entrance are well-preserved, being mainly originals. 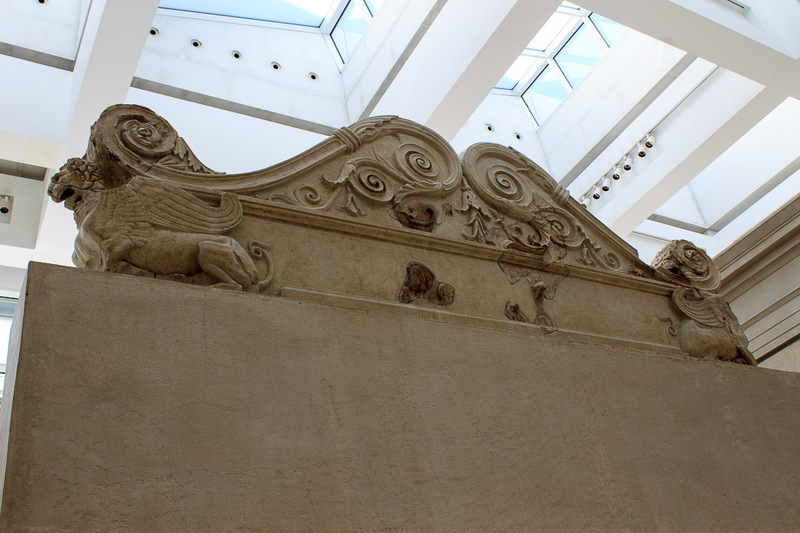 To the upper-left of the Ceremonial Entrance is a panel depicting the myth of the foundation of Rome (two photos below). Romulus and Remus are shown being suckled by the wolf, protected on the right by Faustulus, the farmer who adopted and brought up the twins, and approached on the left by Mars, the god who conceived them in the Vestal priestess Rea Silvia. The fig-tree (ficus ruminalis), under which the twins were suckled, is shown at the centre. The talons of a bird can be made out in the tree: in 1938 these were sketched in as those of an eagle; however they could alternatively belong to a woodpecker, which, like the wolf, is sacred to Mars. Mars is shown dressed for war and carrying a spear; his plumed helmet is decorated with a griffin (half-lion, half-eagle) and his breastplate with the head of a Gorgon (an Egyptian woman who's face turned people who saw her into stone - Yikes, look away!). 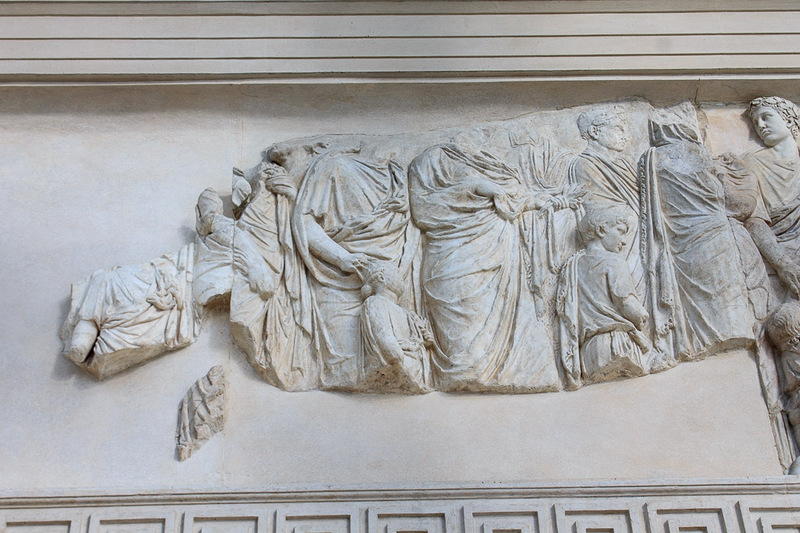 Obviously, very little original material from this frieze has been found; most of this is a sketch, with the few originals placed at their proper location. 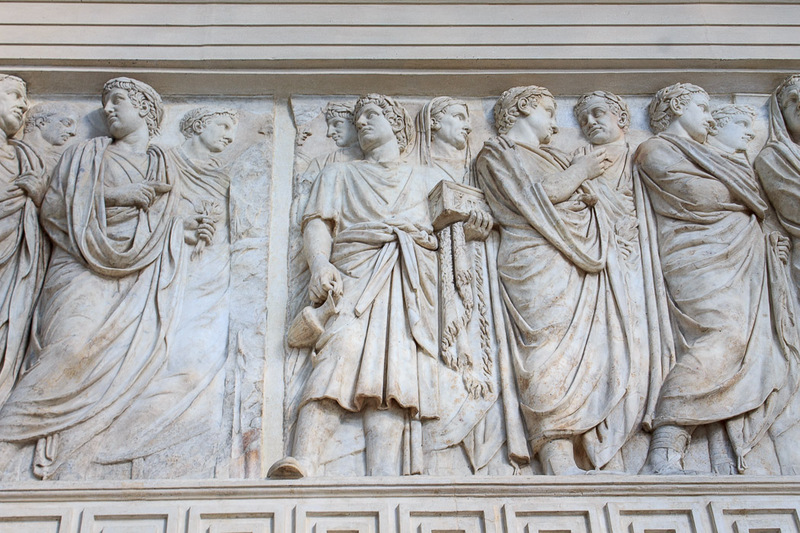 The relief on the upper-right of the Ceremonial Entrance is the most complete of the four upper reliefs surrounding the entrances to the Ara Pacis. 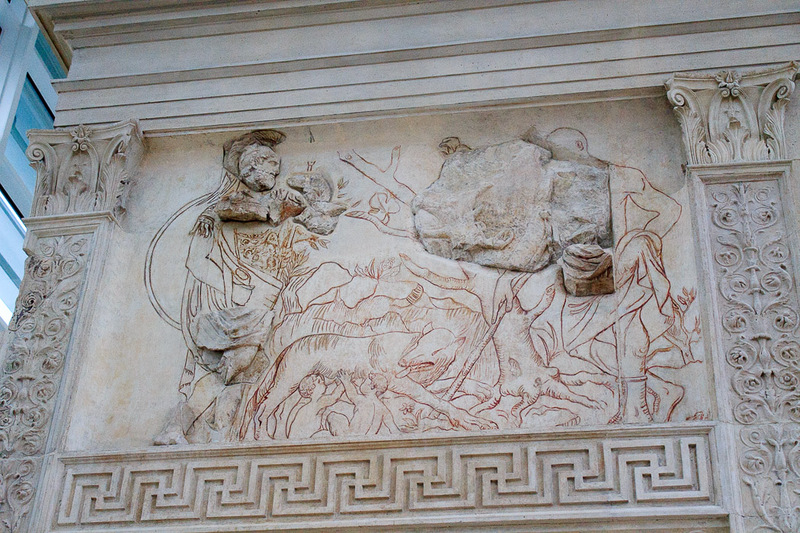 It shows an elderly Aeneas on the right side of the frieze, sacrificing to the Penates (private household deities) (1st photo below). He is dressed in the clothes of a priest, with his head covered, as he makes an offering at a rustic altar. The lower part of his right arm has been lost, but it almost certainly held a patera, a type of ritual cup. The idea is supported by the presence of a young acolyte in the rite (camillus) who is carrying a tray of fruit and bread and, in his right hand, a jug. A second acolyte to his right is driving a sow to the sacrifice. The shrine above them in the background has two seated male figures inside. The scene is probably taking place where the city of Lavinium was founded, at least if it is interpreted in the light of Book VIII of Virgil's Aeneid, which describes the moment when Aeneas, newly arrived in Italy, sacrificed a sow and her piglets to Juno. 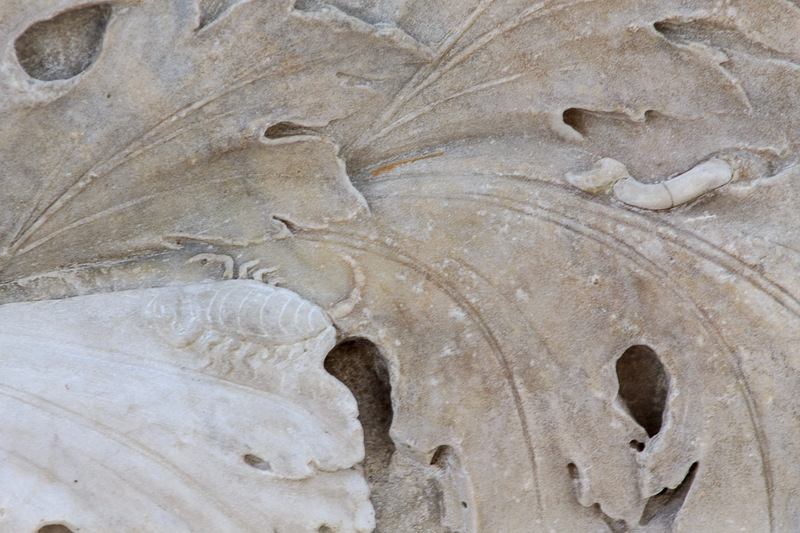 The 2nd photo below shows a possible missing piece of the Aeneas panel. It is the head of a young man, found in 1859. It was identified as part of the Aeneas panel from a figure behind Aeneas in the 1930s, and put into the panel, but it was removed in the 1980s because it was then thought to belong to a male figure in the goddess Rome panel. 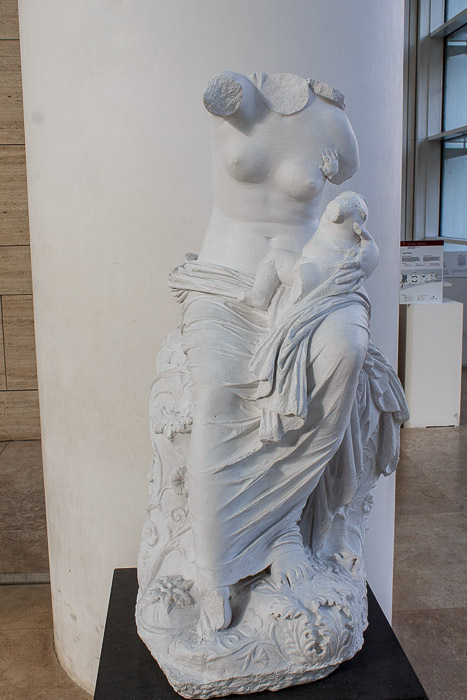 Unsure of its correct placement, it has stayed off the Ara Pacis. It has recently been hypothesised, however, that the figure making the sacrifice is Numa Pompilius, the second of the seven kings of Rome (715-673 BC), who celebrated peace between the Romans and the Sabines in the Field of Mars itself by sacrificing a sow. 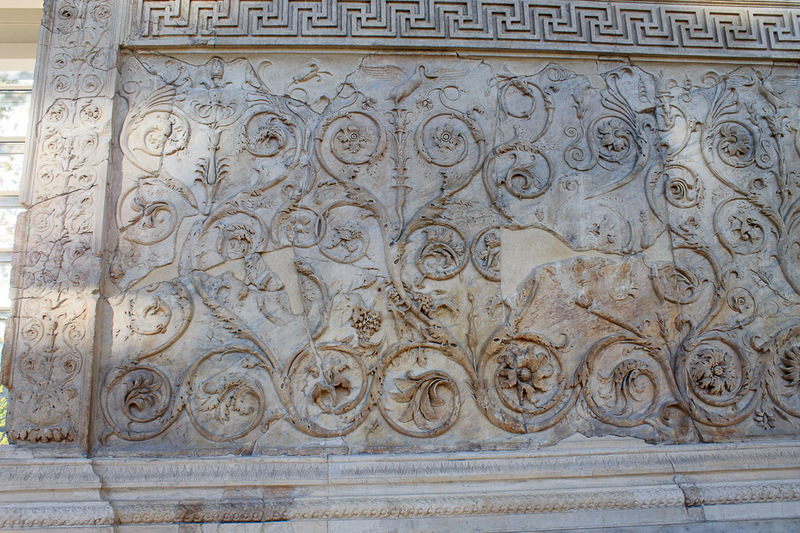 Numa Pompilius has a reputation for peace, the namesake of this altar, having built the Temple of Janus whose doors were open during times of war and closed during times of peace. After securing peace with Rome's neighbors, the Sabines, the doors of the temple were closed, and remained so for the entire duration of Numa's reign, a unique case in Roman history. 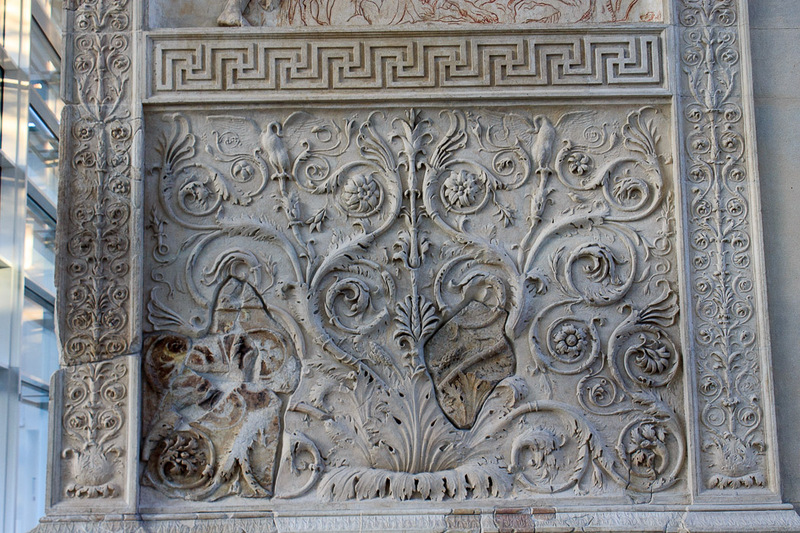 The lower register on this side, as on all four sides, consists of a floral frieze with spirals of ivy that come out from a burst of acanthus leaves at the bottom center and have two swans at the top, left and right. Look closely at the lower panels and you'll find fun features peculiar to each panel. For example, the lower-right panel has a bird facing left, standing on a leaf (1st photo below), near the upper-right corner of the panel (2nd photo below). The lower-left panel is unfortunately almost entirely reconstruction (3rd photo below), so the fun details that were once there have been lost. The border between the upper and lower registers, which runs all the way around the precinct, is shown well in that 3rd photo below, and also in the 4th photo below. 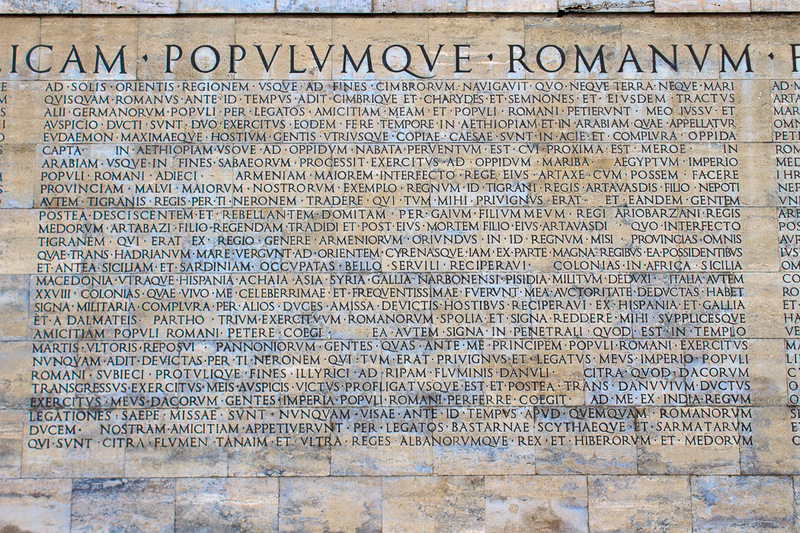 The Public Approach Front (the side opposite the Ceremonial Front, 1st photo below) faced Via Flaminia at the Ara Pacis' original location. The Via Flaminia was the main public avenue which the Ara Pacis was situated along, so was the side the public approached from. Today, this section of the Via Flaminia, south of Piazza del Popolo, is called Via del Corso. 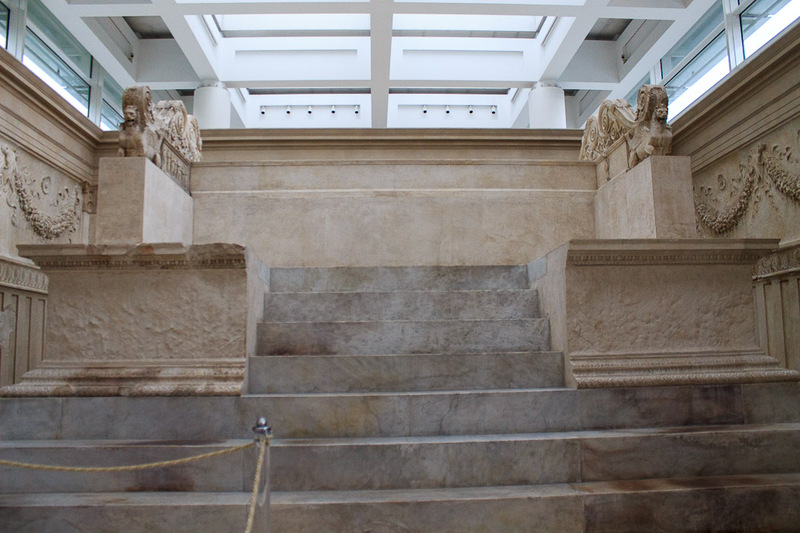 This side of the Ara Pacis had no steps because the ground was higher on this side of the altar, and went downhill toward the Ceremonial Front of the altar, as one approached the Campus Martius. 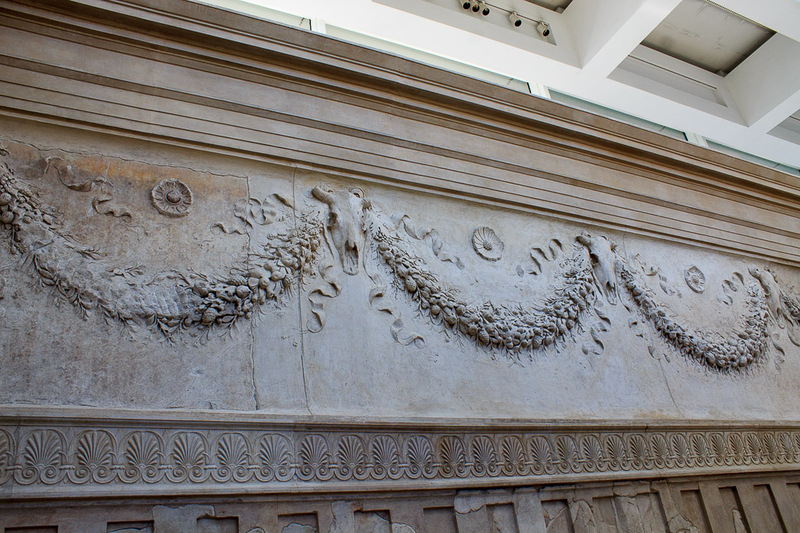 This Public Approach was the side of the Ara Pacis typically shown on coins, so although it now faces the back of the museum, this was the side most known to the ancient public as the front of the Ara Pacis. 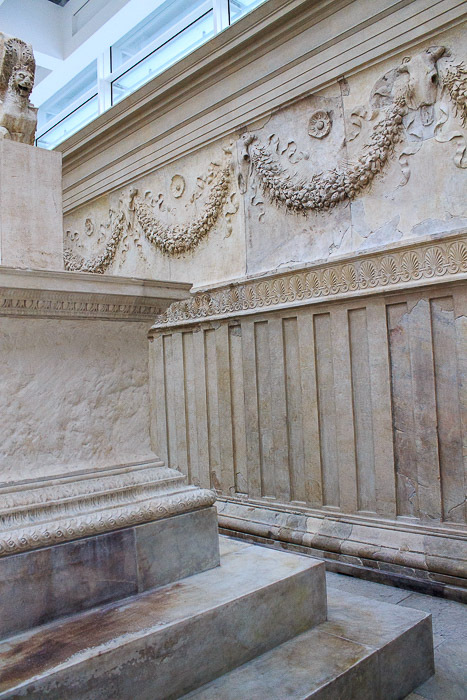 Some of the coins that show the Ara Pacis show the upper entabulature (the topmost band running around the monument) was taller and flared outward much more than the reconstruction shows. 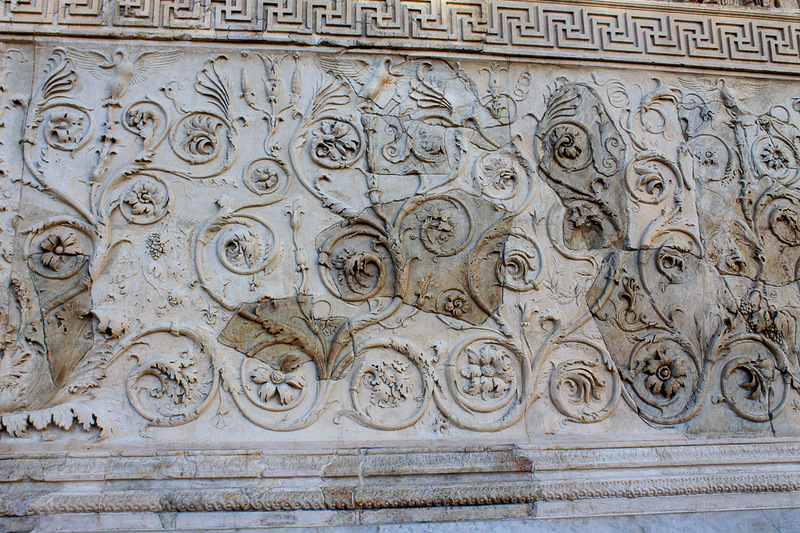 To the upper-left of the entrance is a panel (1st photo below) depicting Tellus, Mother Earth, or, according to a different interpretation, Venus, Aeneas' divine mother and the founder of the Julian family, of which Augustus himself was a member. Yet another reading interprets this central figure as the Pax Augusta, the Peace from which the Altar takes its name. 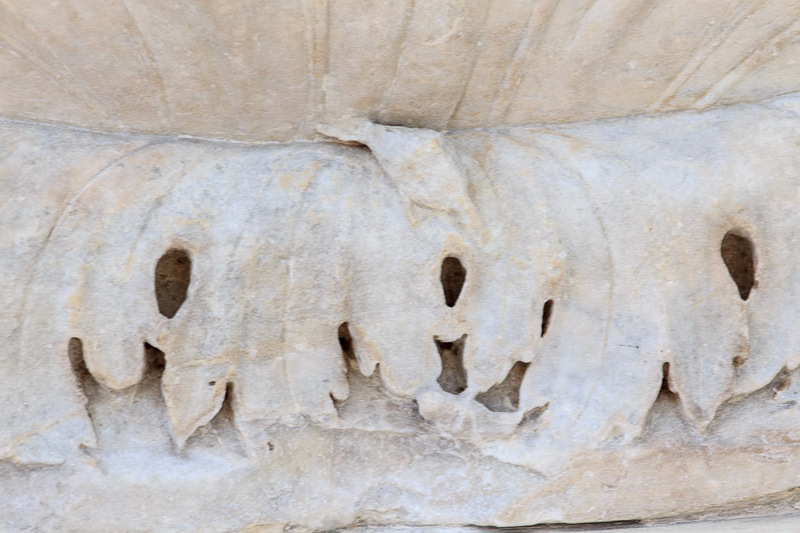 The goddess sits on a rock, dressed in a lightweight loose-fitting garment (a chiton). Her veiled head supports a crown of fruit and flowers, at her feet are an ox resting and a sheep grazing. Two putti hover at the goddess' side; her gaze is turned towards one of them, holding out an apple. 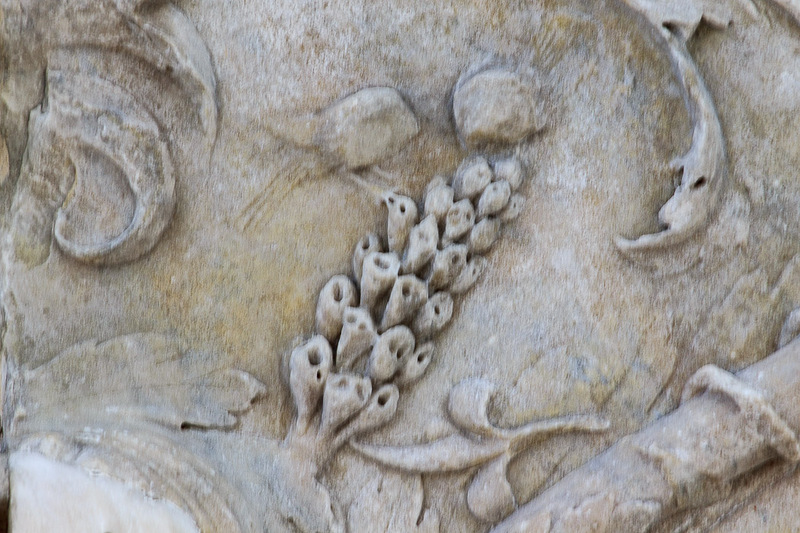 In her lap, a cluster of grapes and pomegranates finishes off the portrait of a fertility goddess, responsible for the flourishing of men, animals and plants. At the sides of the panel two young women are depicted representing the winds that fill sails, the one on the right sitting on a sea snake or dragon, the one on the left on a flying goose or swan, symbols of the gentle winds of the sea and earth respectively. Beneath the nymph on the swan are grasses, and an overturned jug pouring out water with a heron perched on its handle. 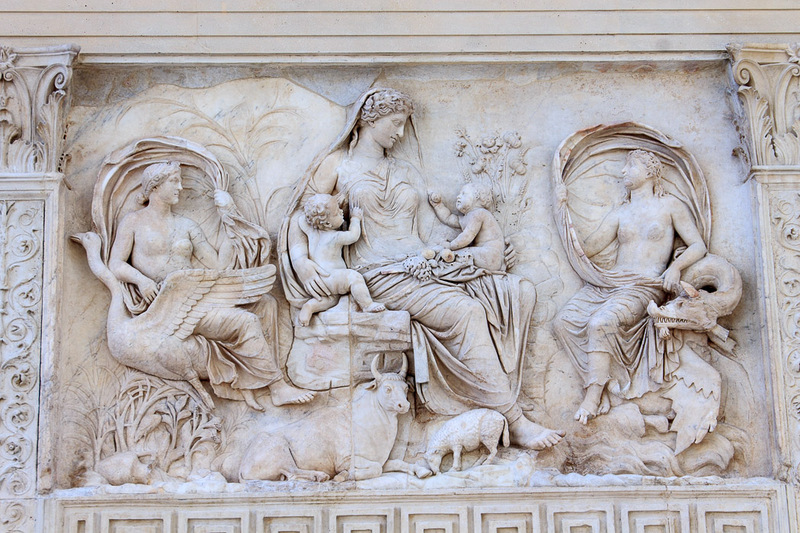 This panel is recreated in its original color beauty 2/3 of the way down the page at Art and Architecture of Ancient Rome. 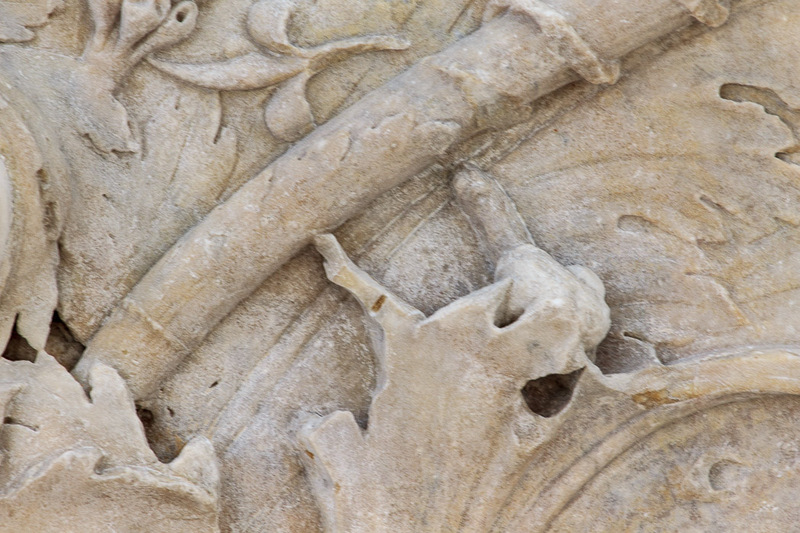 The carving on this panel is very deep, yielding a highly three-dimensional image. The 2nd photo below shows a female statue similar to that on the Tellus panel. 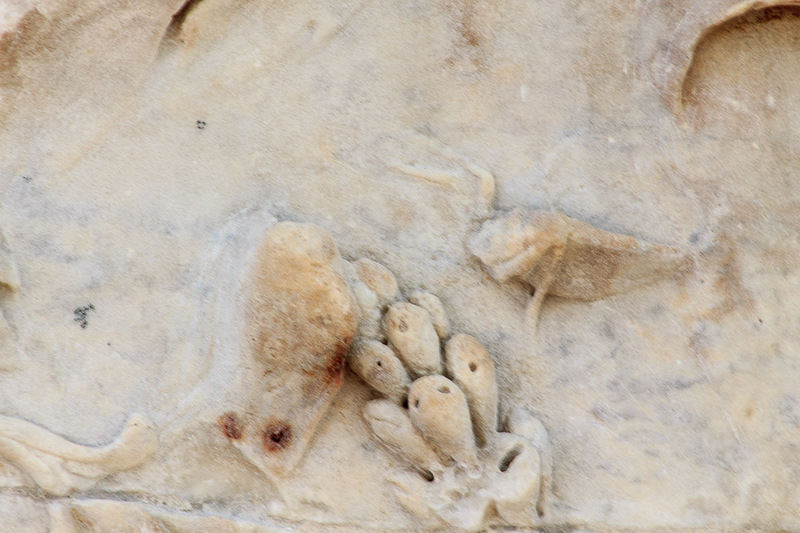 On the upper-right side of the entrance a fragment of a relief of the goddess Roma survives, whose figure has been completed by sketching in on the mortar. Since she is seated on a trophy of weapons, this can only be the goddess Roma. The pile of weapons she sits upon have been confiscated from the enemy, thus forcing peace on them by making them unable to continue making war. Her presence on the altar should be read in close conjunction with that of the Venus / Tellus figure, since prosperity and peace are guaranteed by Roma Victorious. The goddess is represented as an Amazon: on her head she wears a helmet and her right breast is bared, a baldrick hangs across her shoulder, and in it a short sword, in her right hand she holds a spear. Honor (to her right) and Virtue (to her left) were very probably also depicted in the scene, positioned on either side of the goddess, in the form of two young masculine divinities. 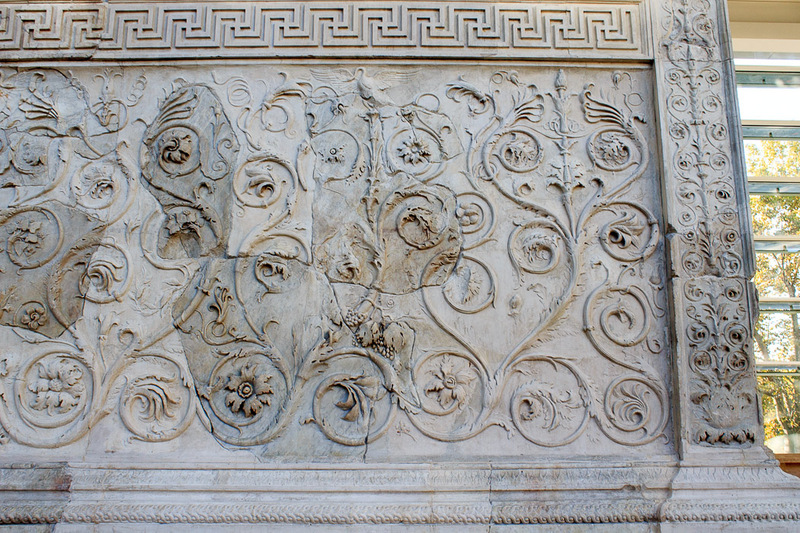 This panel is also recreated in its original color beauty 2/3 of the way down the page at Art and Architecture of Ancient Rome. 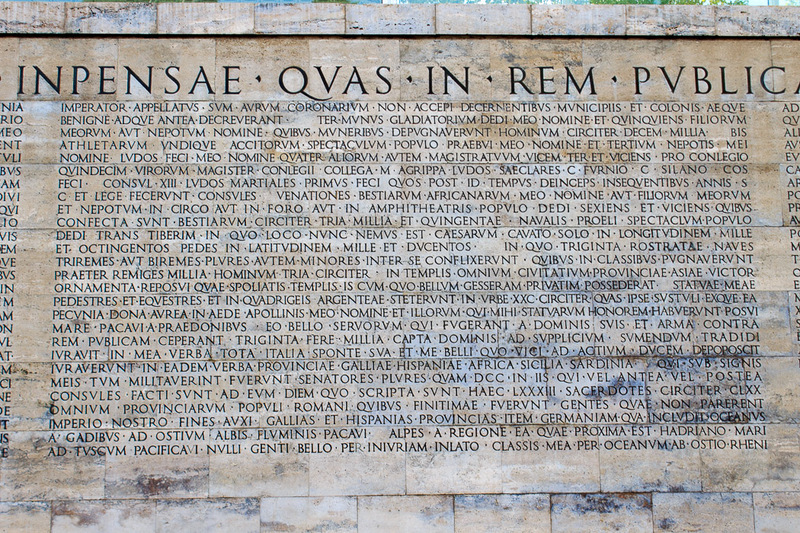 This is the least-intact of the four mythological reliefs which flank the entrances of the Ara Pacis. Only two original fragments of the relief survive (a draped thigh with the lap of a seated figure facing left, and a shield covering the figure's right knee. From this, everything else has been conjectured and reconstructed, but there seems to be agreement among historians that this reconstruction makes sense and is correct. 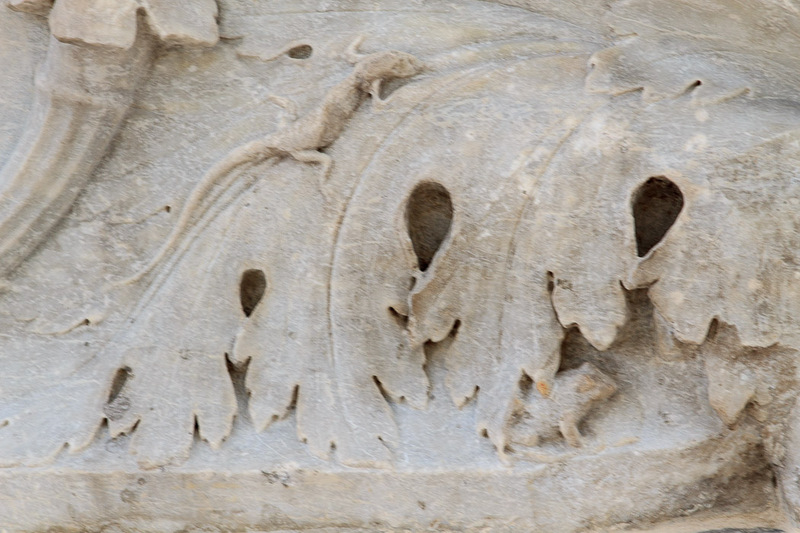 The lower-left panel on the Public Front (1st photo below) has: two small birds facing each other (2nd photo below) just to the right of center, slightly below the center of the panel; a snail to their lower-right (3rd photo below); a scorpion and a worm (4th photo below) on the acanthus leaves at the bottom, below that snail; and a salamander and a frog (5th photo below) on the bottom acanthus leaves to the left of center, balancing the scorpion and worm. The lower-right panel (1st photo below) has: a grasshopper (2nd photo below) to the left of the stalk just above the acanthus leaves; a bird (3rd photo below) to the right of the stalk just above the acanthus leaves; another bird (4th photo below) at the bottom of the stalk with another grasshopper below it; and a worm (5th photo below) to their left. On the upper register of the Side With Augustus (1st and 2nd photos below) and the Side Opposite Augustus (3rd and 4th photos below), two dense crowds of people are shown, moving from the Public Approach Front toward the Ceremonial Front of the precinct. They appear to represent a single slow-moving procession viewed from both sides rather than being different parts of a procession or two different processions. Among them are priests, acolytes of the cult, magistrates, men, women and children, whose historical identity can only be constructed hypothetically. 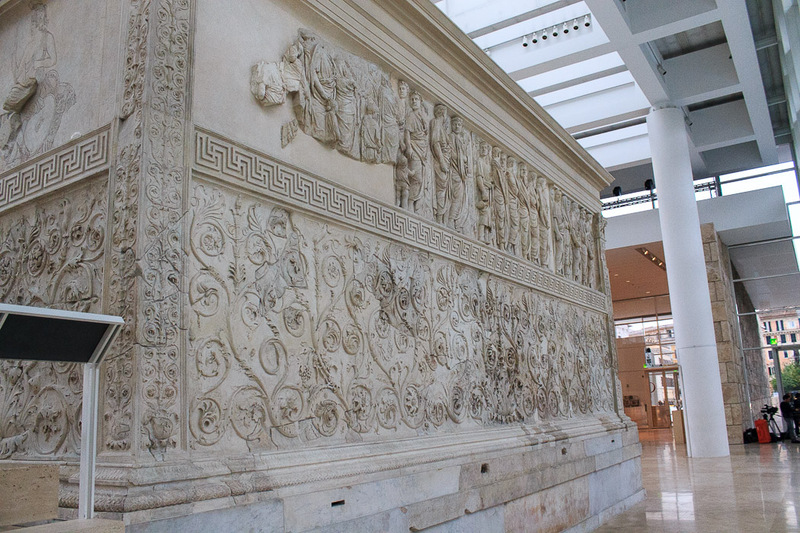 It is not entirely clear what the procession is doing: some think that the scene shows Augustus' return, specifically the ceremony of welcome paid to him at his return from his long absence in Gaul and Spain; others think it represents the inauguration of the Ara Pacis itself, the ceremony of 13 BC during which the space on which the altar would be built was defined and consecrated. The procession begins, on both sides of the enclosure, with the lictors, followed by members of the great priestly schools and perhaps by the consuls. Immediately after this, members of Augustus' family start to appear. On right side as you walked into the museum is the Side With Augustus, shown in 6 closeup photos. On this side, the procession is walking from the right (public approach front) to the left (ceremonial front), so we'll start on the left, with the people in the front of the procession. The first 1-3/4 closeup photos are very fragmented. The people in that region are lictors, the emperor's bodyguards. The fourth face from the right edge of the 3rd photo below, which is the same as the second face from the left edge of the 4th image below, is securely-identified as Augustus, crowned with laurel. 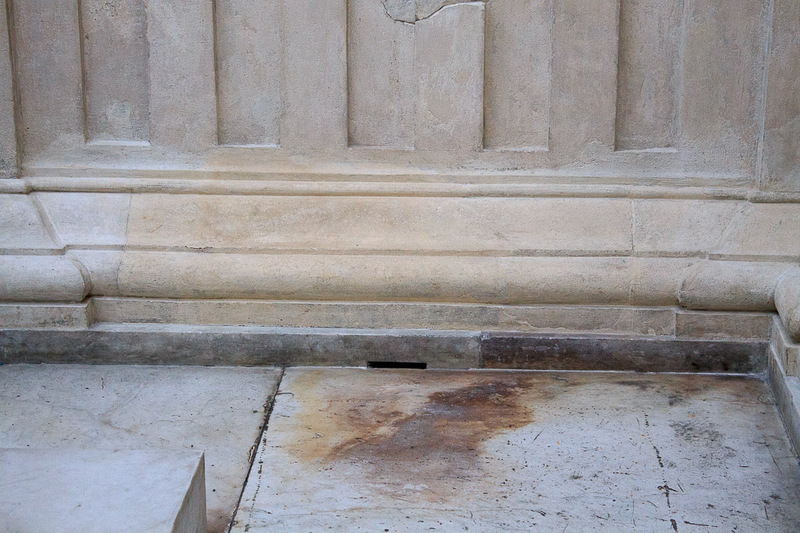 His face and head are complete enough to identify, although they were damaged by the cornerstone of the Renaissance palazzo built on top of the original site of the Ara Pacis, and he is surrounded by more empty space than other figures. Only the left half of his body remains; the right half is lost to time. He is represented as "pontifex maximus," or high priest, veiled and acting in his official capacity as priests, ready to perform a sacrifice. The rex sacrorum (a high priest) is close behind him. Four flamines maiores, chief priests with leather headgear with a chin-strap, topped with an olive branch and a metal point, are also securely identified (the 6th, 8th, 9th and 10th heads from the left in the 4th photo above). 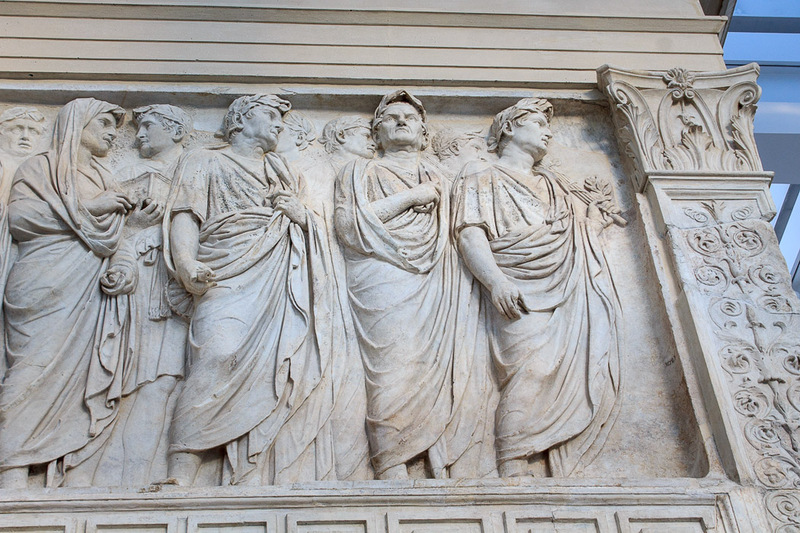 They represent the four State cults: Mars, Quirinus, Deified Julius Caesar (in the background, the 9th head), and Jupiter (the one with the thin stick in his right hand, the 10th head). The first two of them (the 6th and 8th heads) wear rings on their left hand. Notice that the 10th head in the 4th photo above is the 1st head in the 1st photo below, because we're switching to that photo now. 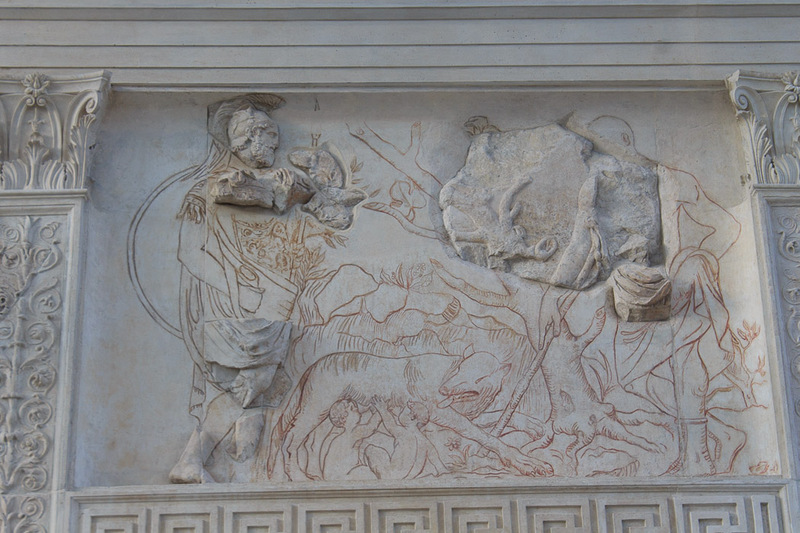 The 3rd face in the 1st photo below is the "flaminius lictor", carrying a ritual axe on his shoulder, who will kill the sacrificial bull or other animal. The 5th face in the 1st photo below is a beloved character, Marcus Agrippa, with his head covered by the edge of his toga which is held with his left hand, and with a roll of parchment in his right hand. 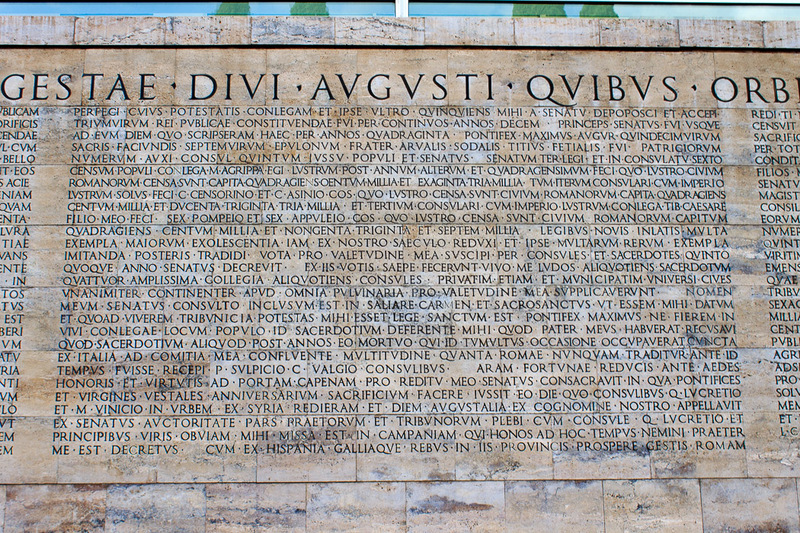 Agrippa was Augustus' right-hand man, his friend and also his son-in-law, being his daughter Julia's second husband. Augustus and Agrippa are veiled, signifying that they are acting in their official capacity as priests, ready to perform a sacrifice. 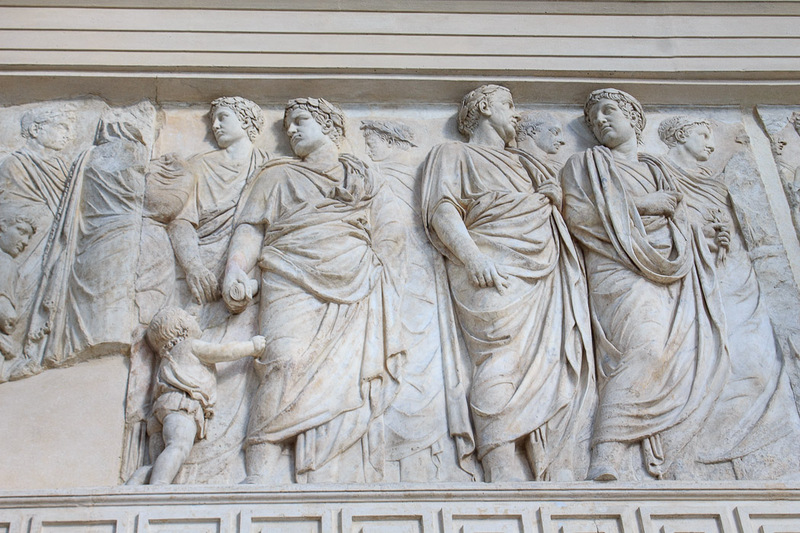 Right behind Agrippa is his young son, Gaius Caesar (the child just right of center of the photo above), shown as a child holding onto his father's clothes. Agrippa and Julia's other son, therefore Augustus' second grandchild, was Lucius Caesar. Gaius and Lucius were adopted by their grandfather with the intention that they would succeed him, although their deaths, perhaps at the hands of Livia (Augustus' wife), ruined this plan, resulting in the rise to power of Tiberius, who was Livia's son. 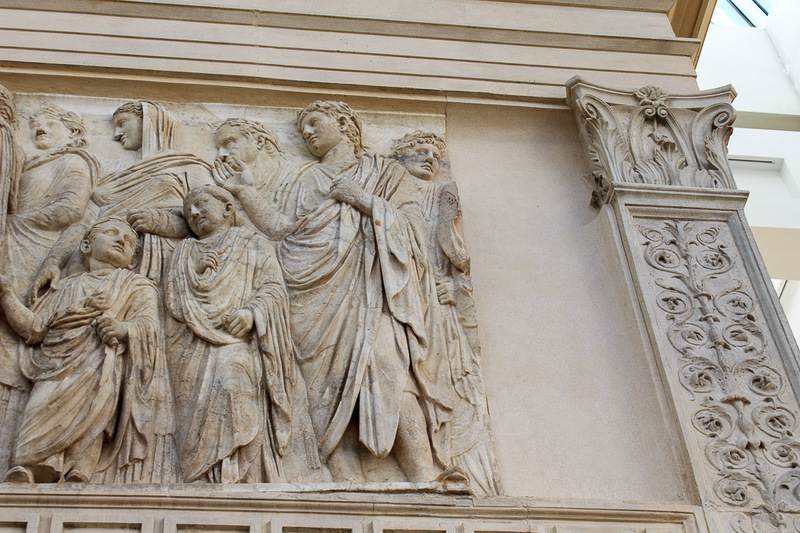 On the Ara Pacis, Gaius is turned toward the rear of the procession, looking at the woman behind him who is either Julia, his mother, or Livia, his grandmother. 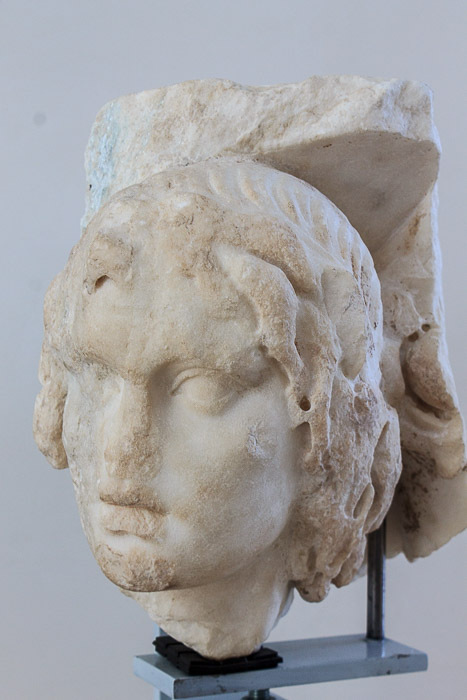 She is depicted veiled and crowned with laurel, which marks her as a woman of high rank. Some scholars believe the child is not Gaius, though. The necklace and long hair of this child suggest that he is non-Roman; perhaps a barbarian prince from the east who is a guest (or a hostage) of Rome. Julia or Livia is the left-most foreground character in the 1st photo below, a slight overlap of the photo above. Tiberius is usually identified as the male figure in the foreground following Julia or Livia; however there is some doubt as to this interpretation since the figure in question is wearing plebian shoes, which is particularly inappropriate for Tiberius, who was a member of one of the most ancient noble families of Rome. Two people behind Julia or Livia is a seam in the reconstruction that doesn't quite match properly. 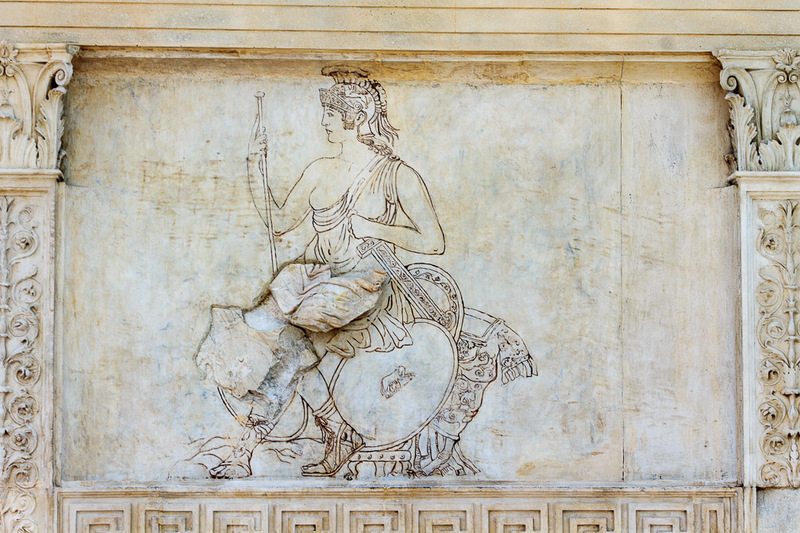 It is believed that this is another flaw in the rushed reconstruction of 1939, that a panel is missing here, and that the sparse fragments at the left edge of this frieze should be closer together. 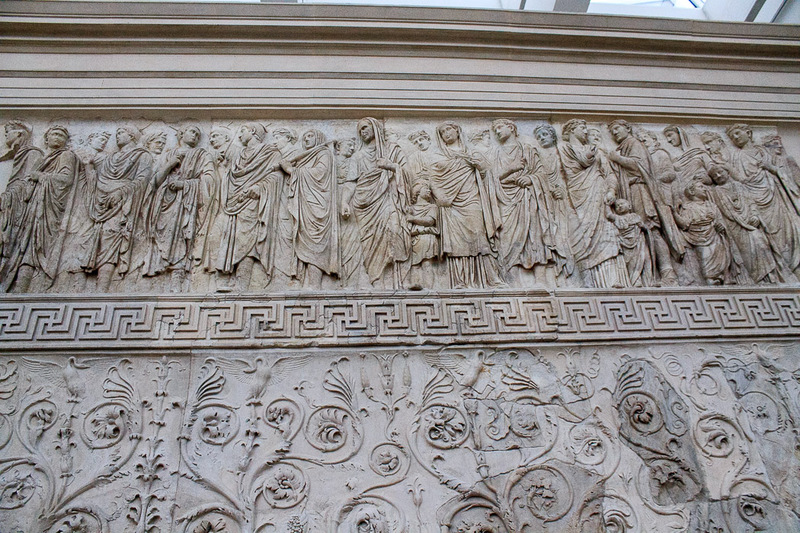 The figures in this final third of the panel are thought to be members of Augustus' family, but are not securely identified. The next child after Gaius, slightly right of center of the photo below, is identified as the infant Germanicus, who is holding the toga of his mother, Antonia the Younger, Augustus' niece. The man she is looking at, behind her, is her husband and Germanicus' father, Drusus. Drusus is the only figure to be shown in military dress - he wears the characteristic paludamentum: in 13 BC he was occupied in fighting the Germanic tribes to the East of the Rhine. A second family group follows, made up in a similar fashion by Antonia the Elder, another of Augustus' nieces, the second person behind Drusus, shown as a woman whose head is draped with a hood. 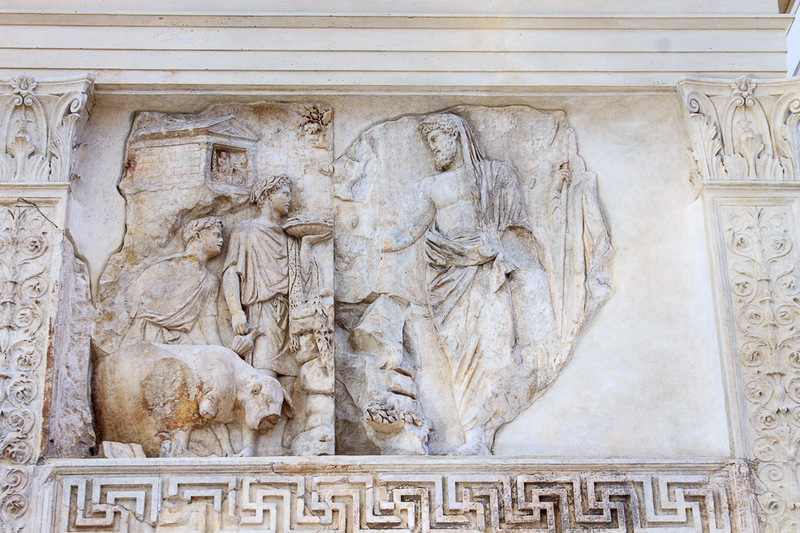 The man in the foreground behind her is Lucius Domitian Enobarbus, who was consul in 16 BC, and is the second-to-last person on the frieze. Between Antonia the Elder and him are their children Domitia (the taller of the two children, on the right) and Gneus Domitian Enobarbus, the future father of Nero. 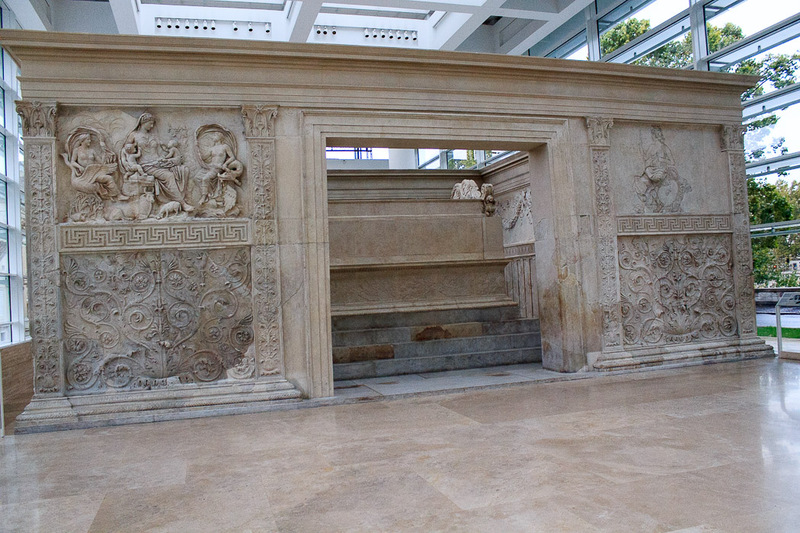 On the left side of the Ara Pacis as you entered the museum is the Side Opposite Augustus. Most of the heads on the Side Opposite Augustus have been restored. The procession here is walking from the left (public approach front) to the right (ceremonial front), so we'll start on the right side of this frieze, which is the front of the procession, which is the 6th photo below. 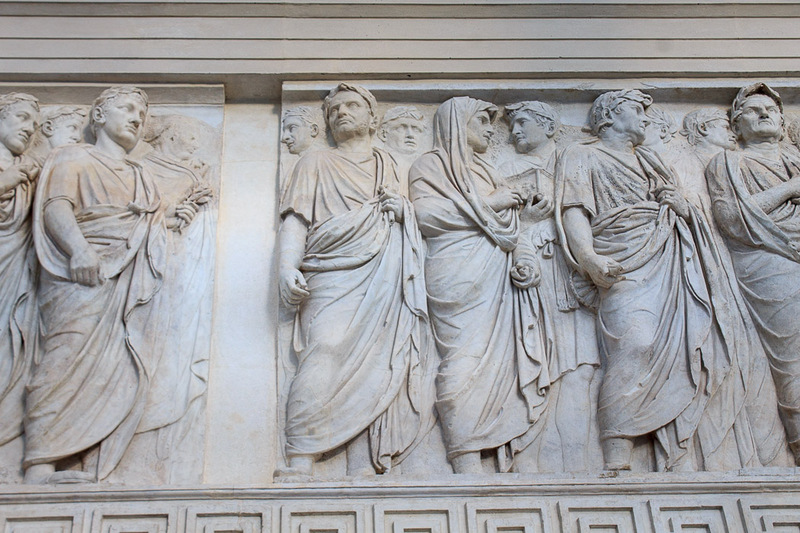 Reading from the right, the first two foreground figures are lictors (bodyguards), carrying fasces (bundles of rods symbolizing how unity brings strength, the source of the modern word "fascism"). Next are the "augurs" (responsible for interpreting omens in public life, anything happening that is believed to bring good or evil events in the future), and the "septemviri epulones" (seven priests) in charge of religious banquets, identified by the incense box they carry with special symbols. 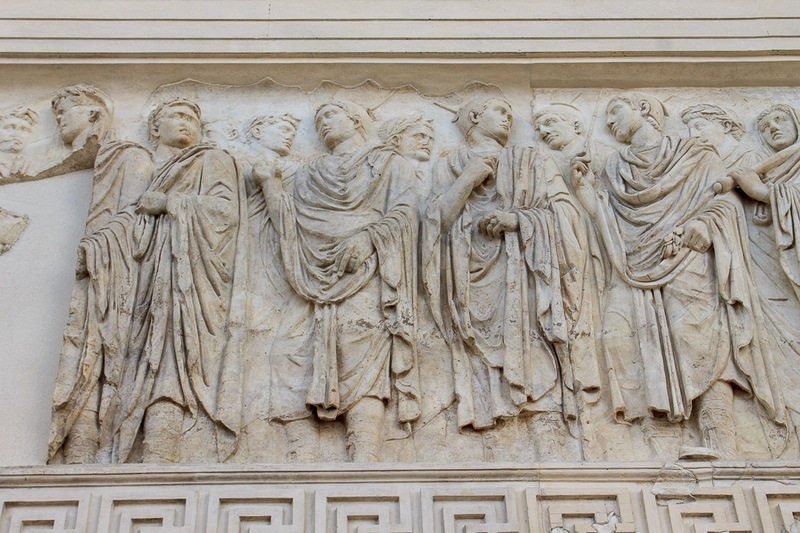 One of the seven is not shown since he would be in the gap in the frieze. Next are 21 members of the "quindecemviri sacris faciundis", Roman priests in charge of the sibylline books (a collection of prophecies). A "camillus," or adolescent boy, assistant of the priests, with an incense box is among them. 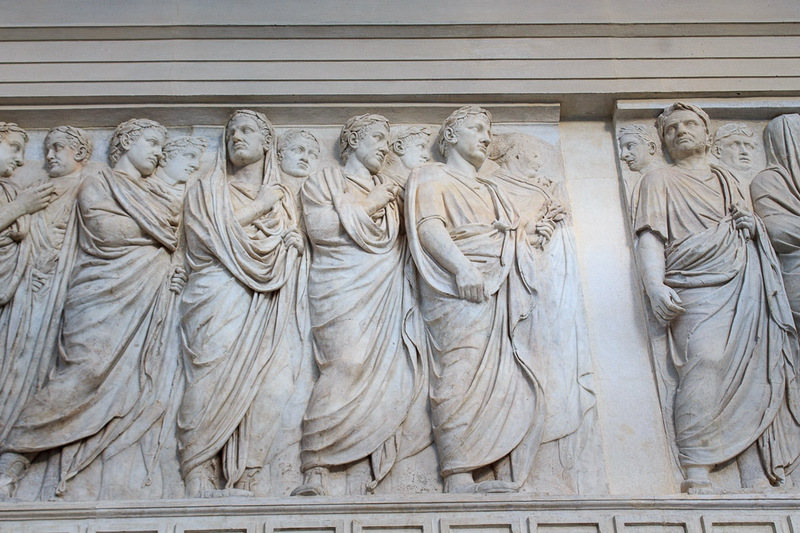 The other 2 members are on the Side With Augustus: Augustus himself and Agrippa. 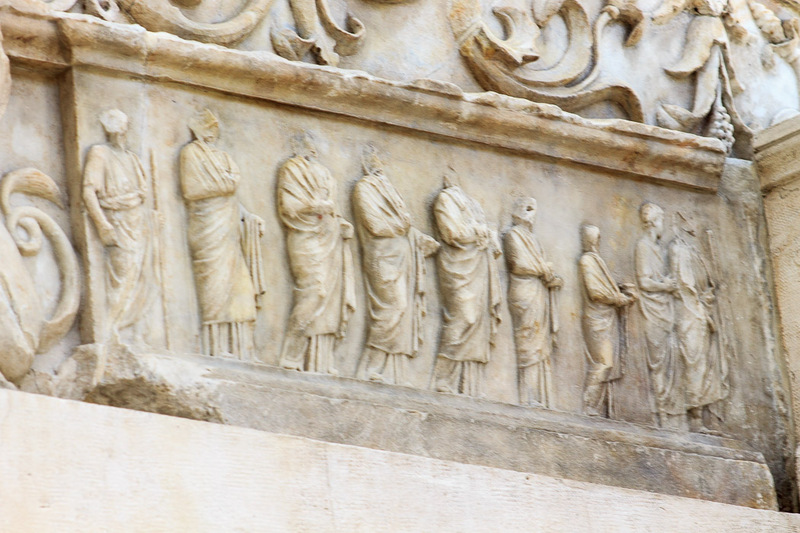 The left-most portion of the frieze consists of members of the imperial family. 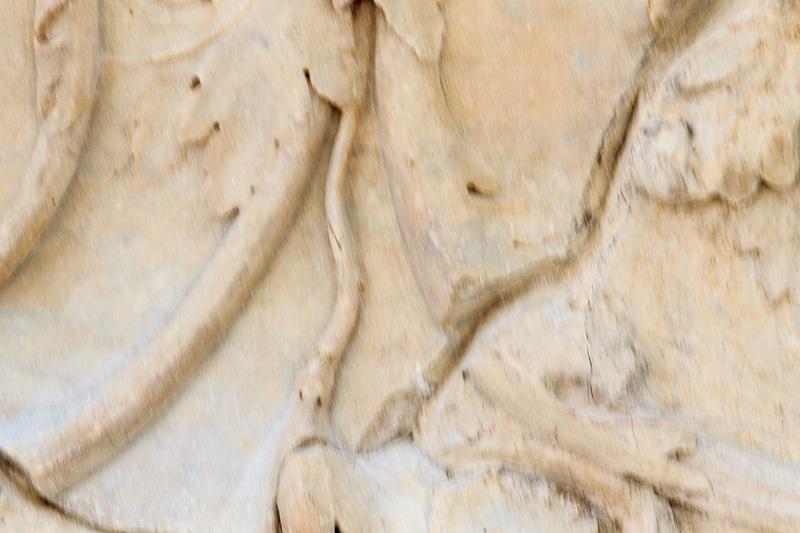 The veiled leading figure (first figure with legs missing) might be Julia, daughter of Augustus, or Livia, if Julia is on the Side With Augustus. The child just on her right might be Lucius Caesar. The man behind her, child behind her, and faded figure behind them are unknown, though the child might be Gaius Caesar. The next woman, with barely any detail remaining in her head, is Octavia Minor. The child behind her is Julia Minor, and the adult touching her head is either Julius Antonius (a son of Marc Antony) or Marcus Appuleius. Next behind him, with basically only a right arm is Marcella Major (daughter of Octavia Minor). The final figure at the left edge is a child, possibly Lucius Antonius. "The templa minora were created by the Augurs (priests), who encircled the chosen places with wooden panels or with drapery, so that they only had one entrance, and demarcated the space with the customary formulae. The temple, therefore, is an enclosed space, consecrated in such a way that it is open on one side and has its corners clearly determined on the ground." 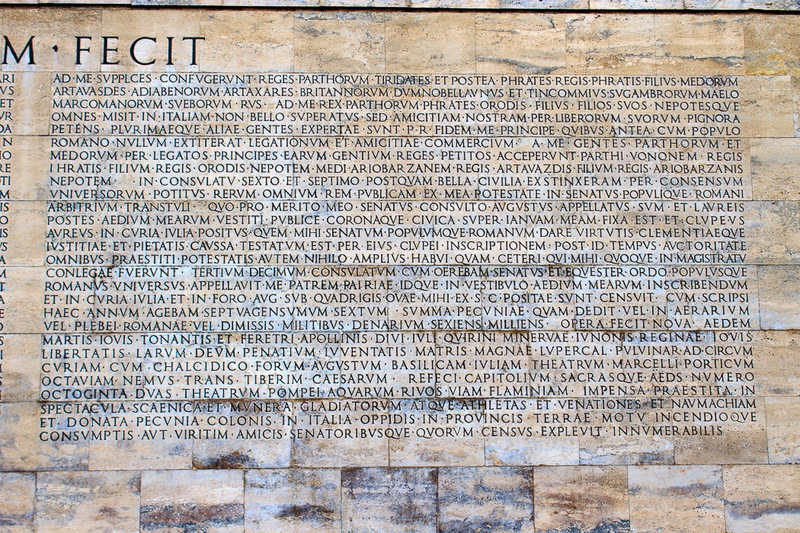 Except for the fact that the Ara Pacis has two entrances, this description fits the monument extremely closely. Even its internal decoration shows, in the lower parts, the wooden boards, which, in archaic temples, delimited the space that had been consecrated with sacred formulae. The interior of the enclosure, like the exterior, is divided into two registers placed one above the other and separated by a band (1st photo below), with the band on the interior being made of palmettes. In the lower register the decoration is a simple version of the planks from the wooden enclosures which marked out the sacred space (1st and 2nd photos below); the higher register (3rd, 4th and 5th photo below), however, is richly adorned with festoons and ox skulls, interspersed with paterae, a libation bowl with a bellybutton in the center (1st, 3rd, 4th and 5th photos below). These motifs also are related to the decoration that was placed above the wooden enclosure, in this case garlands heavily weighed down with ears of corn, with berries and fruits of every season, wild and cultivated, attached to the supports by means of ribbons and sacred fillets. The interior is decorated with pilasters (square columns attached to the wall), topped with Corinthian capitals. In the corners, those pilasters are folded, and the ox-skulls are divided in half (1st and 2nd photos below). 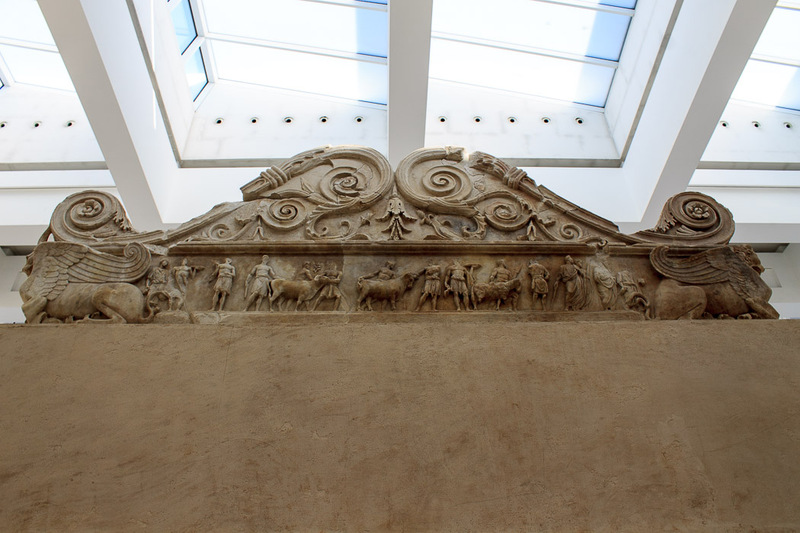 At the center of the Ara Pacis is the altar table on which animal carcasses and wine were offered to the gods (1st photo below). The altar table takes up almost all of the internal space of the enclosure; between the altar and the precinct there is only a narrow passageway, with the floor pavement sloping gently toward the exterior in such a way as to allow both rainwater and water used in the ritual of sacrifice to flow out of the structure through small drains along the edge (interior: 2nd photo below, exterior: 3rd photo below). The altar stands on a podium of four steps, on top of which is the altar base, with another four steps at the front only. Above this rises the altar table, closed between a shelf on each side. 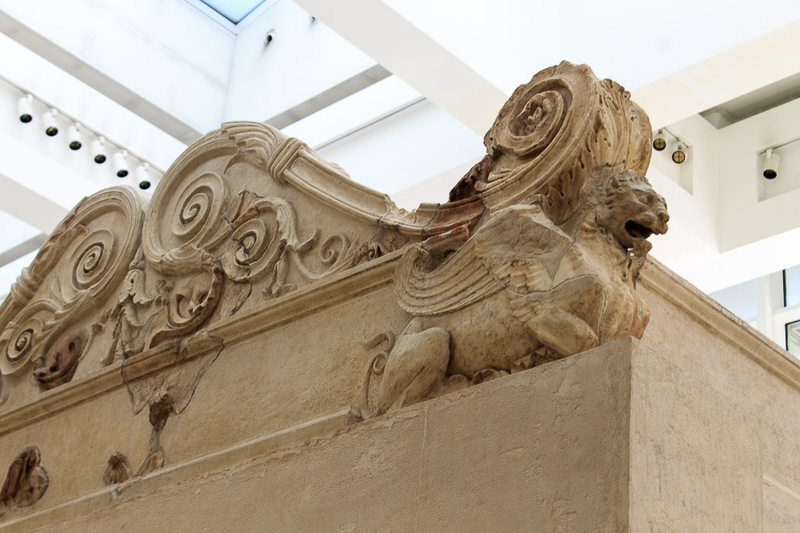 The two side supports are decorated with acroteria, floral volutes and winged lions. The left side of the front of the altar is shown in the 1st photo below, and in successive closeups in the 2nd, 3rd and 4th photos below. On the inside of the left side wall the six Vestal Virgins can be seen (best in the 3rd and 4th photos below), with their heads covered: these were the girls appointed by the Pontifex Maximus, the high priest of the city, chosen from the daughters of the aristocracy between the ages of six and ten, who then remained the guardians of the sacred flame for 30 years. Here they are shown, in order of decreasing height and presumably age, flanked by male figures, preparing a religious sacrifice. 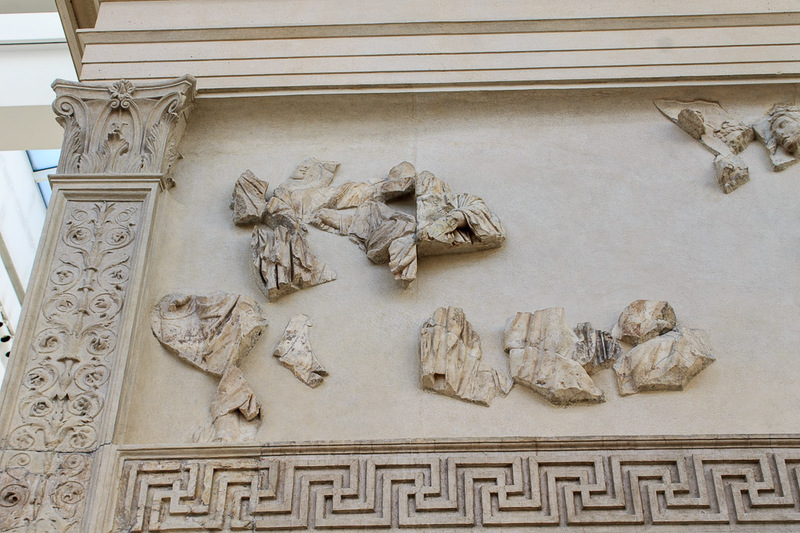 Only a fragment remains of the frieze opposite that of the Vestals (1st photo below). It shows two figures, the first of whom is a priest, or more precisely a flamen, while the figure following him is sometimes identified as Augustus himself, possibly shown wearing the attire of the Pontifex Maximus, a position which he assumed in 12 BC upon the death of Aemilius Lepidus while the Ara Pacis was being built. 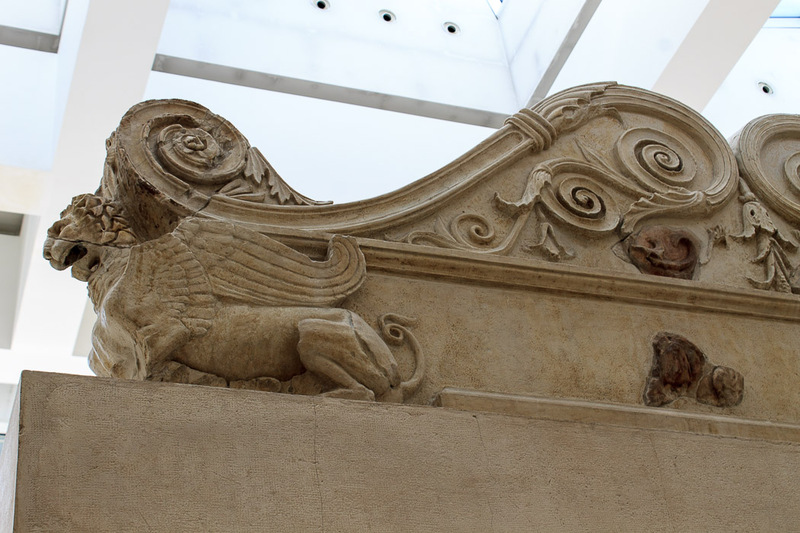 Griffins are prevalent from the back of the altar (the side facing the Public Approach Front of the Ara Pacis), but very little of the frieze on this side remains. On the outside of the left support a procession of three animals has survived, an ox, bull, and ram being led to the sacrifice by twelve adepts (victimarii) in short tunics (1st and 2nd photos below). In their hands they hold the sacrificial instruments: trays, the knife, the club, the laurel branch for aspersion. They are proceeded by a man wearing a toga (perhaps a priest) accompanied by helpers and acolytes of the cult. Griffins appear at the right and left edge of the altar. 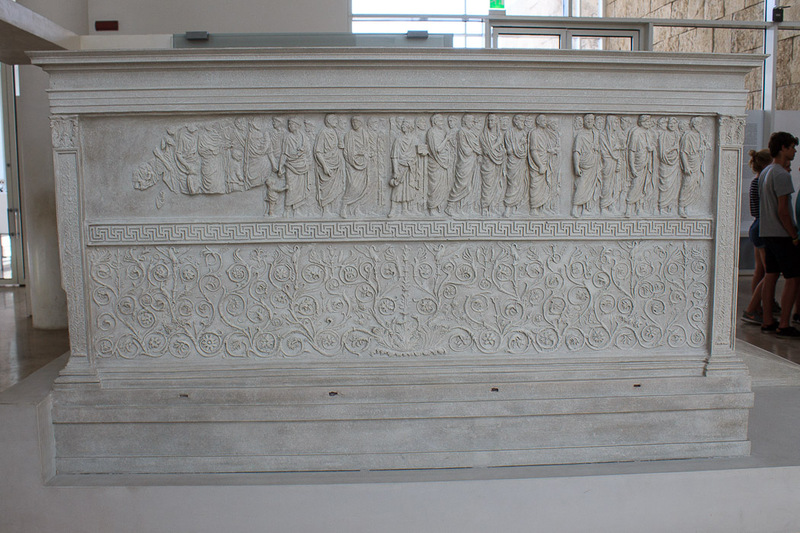 The fragments of the altar frieze probably refer to a particular sacrifice, perhaps that of the Pax Augusta itself, which the Senate had decreed should be celebrated every year on the 30th of January, commemorating the consecration of the altar (3rd photo below). 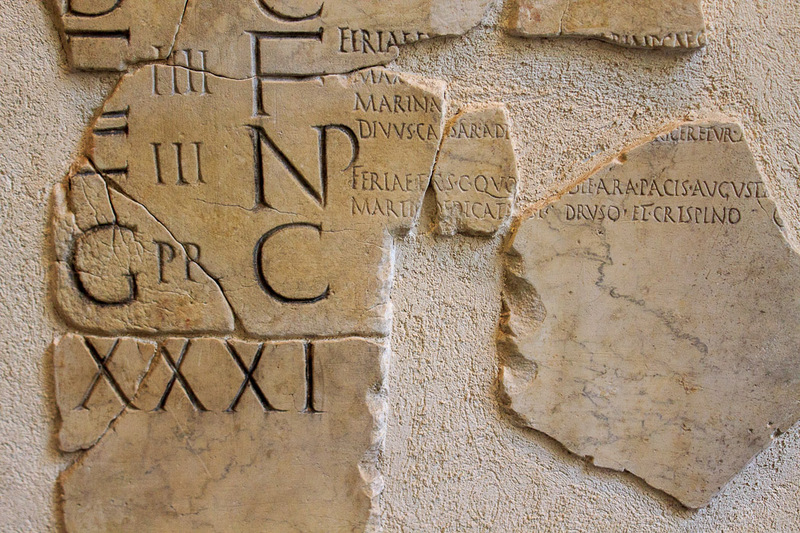 Closeup of the Roman calendar (Fasti Praenestini) from 6-10 AD, in the Palazzo Massimo. 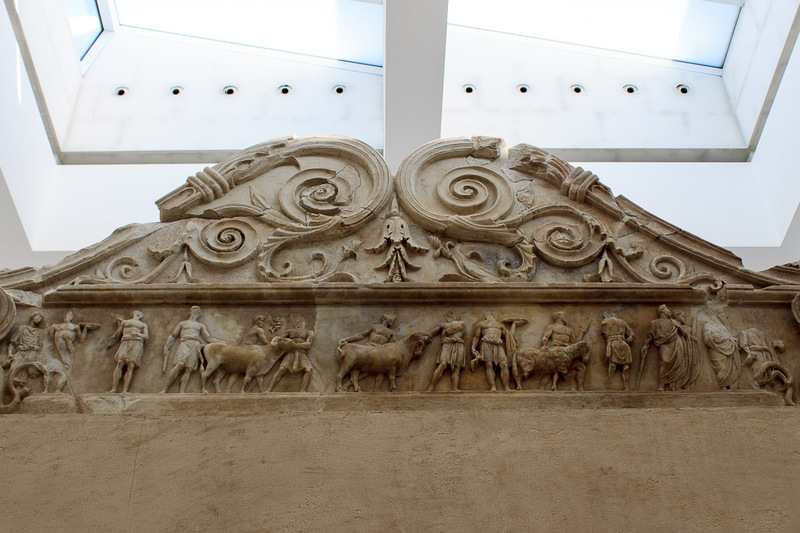 January 30th, the second day from the bottom of January, was the anniversary of the dedication of the Ara Pacis in 9 BC.